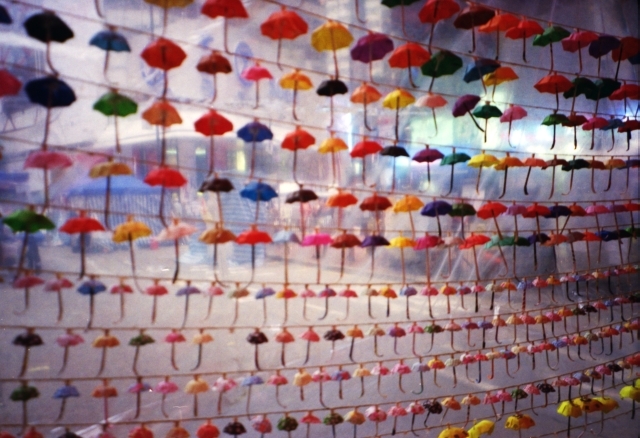 All images were taken with one camera, one lens, on the same roll of film and on the same day. 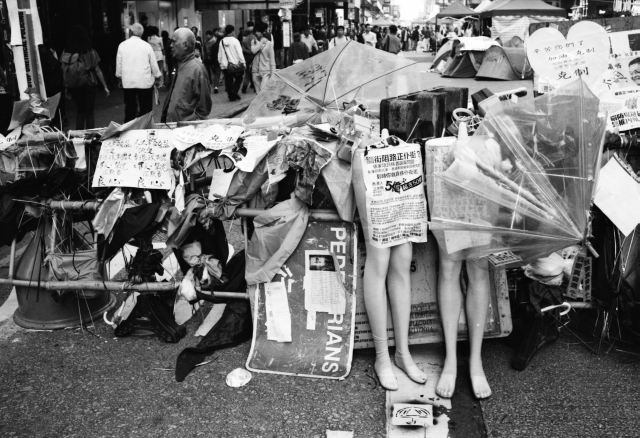 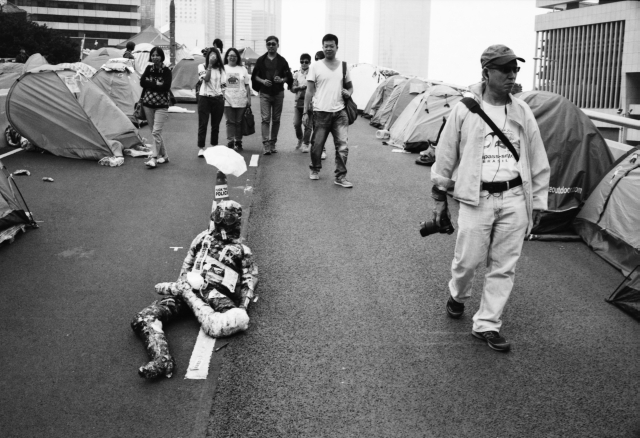 This is a visual meditation on Occupy Central. 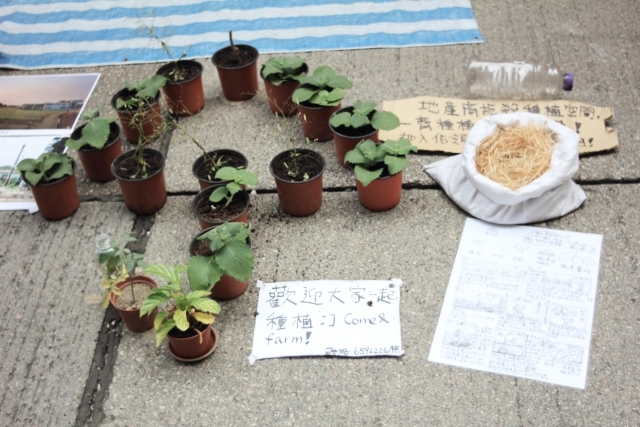 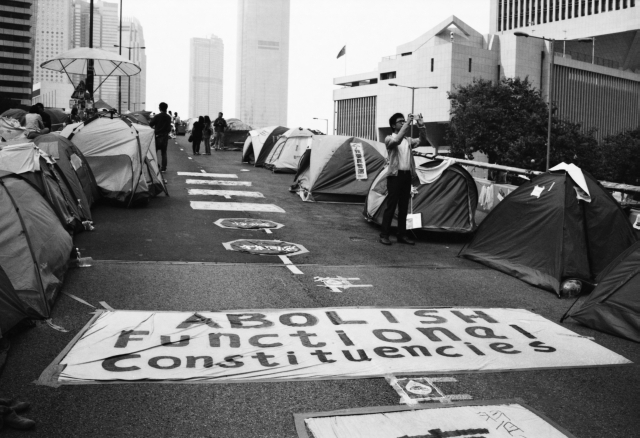 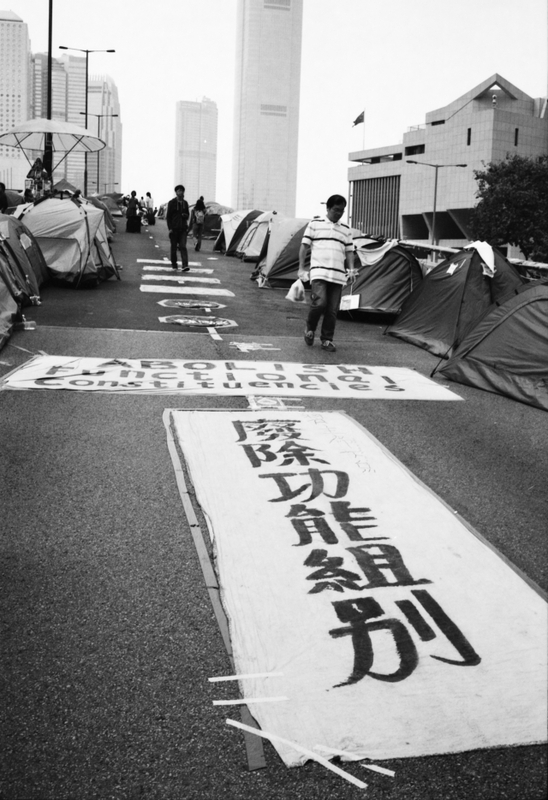 Once upon a time, Occupy Central was an idea. 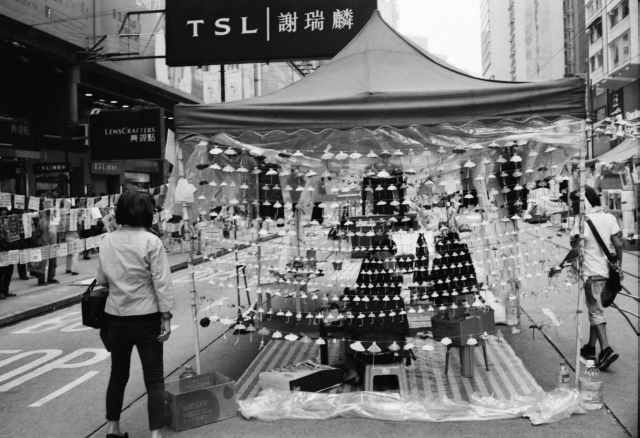 It was an event that was yet to come. 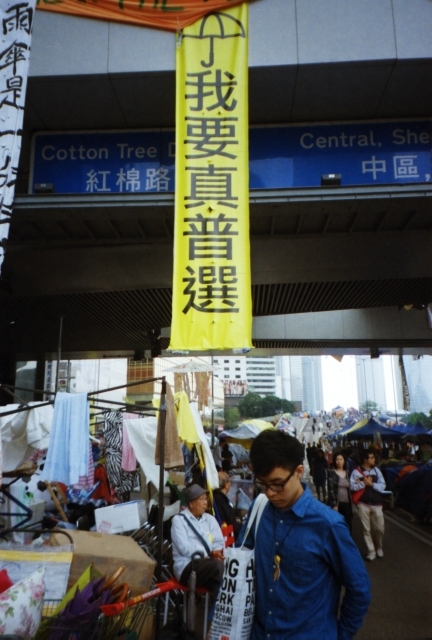 It then became an event. 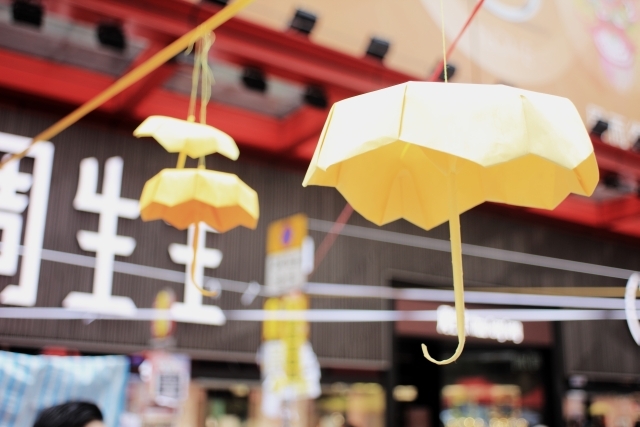 It will be an event that is always already present, even if it ends today or at some point in the future. 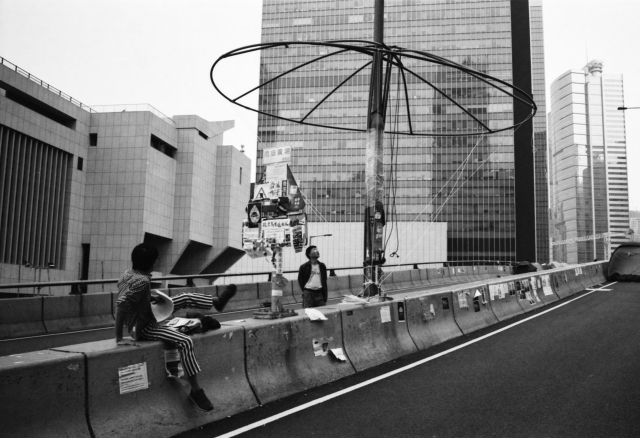 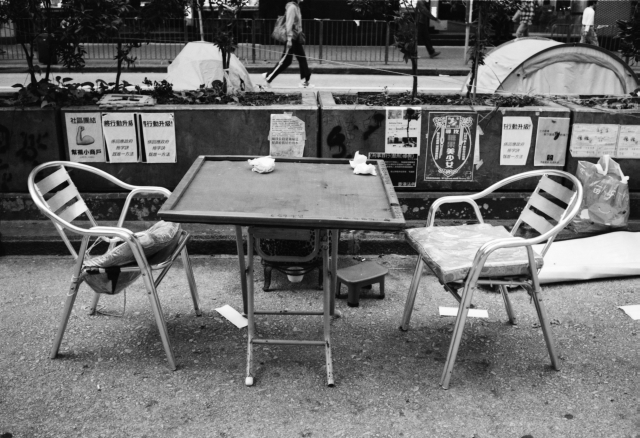 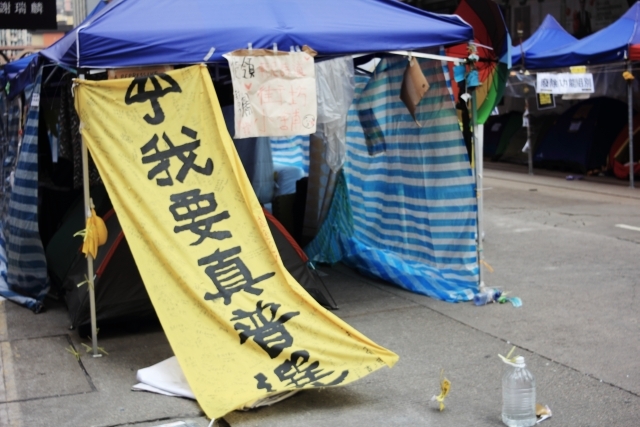 There’s definitely a sense that things are winding down at two of the three Occupy sites. 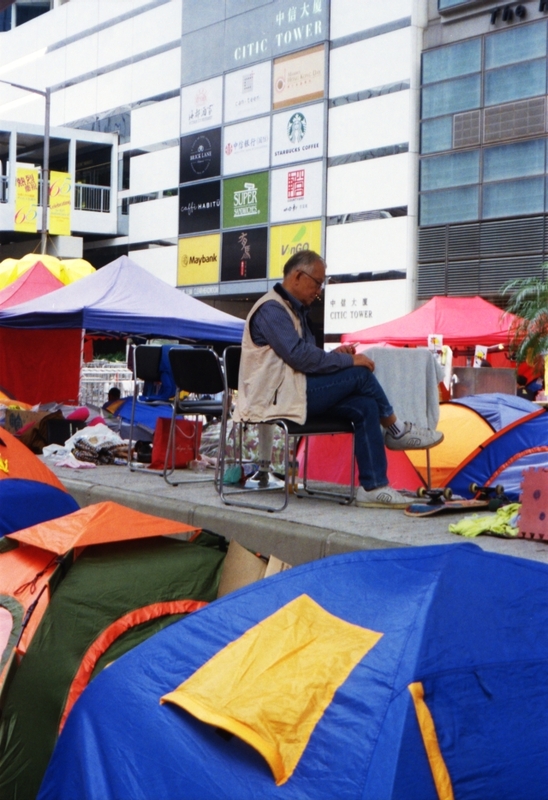 There’re fewer tents now at Mong Kok. 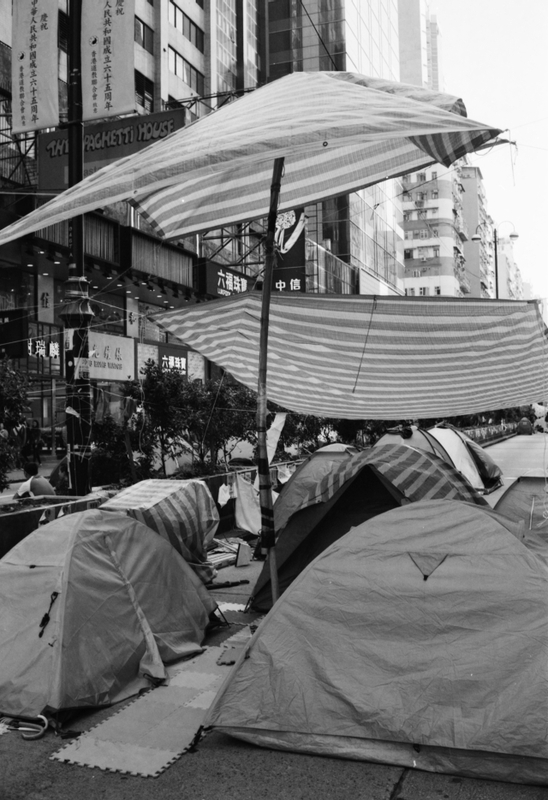 I’m focusing more on the objects this time – how do you photograph tents and people that are not there? 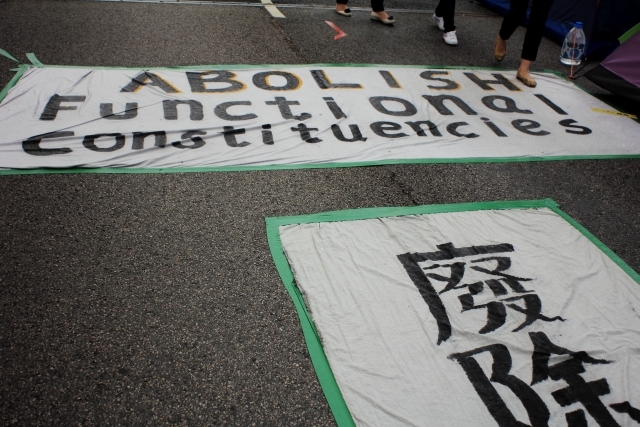 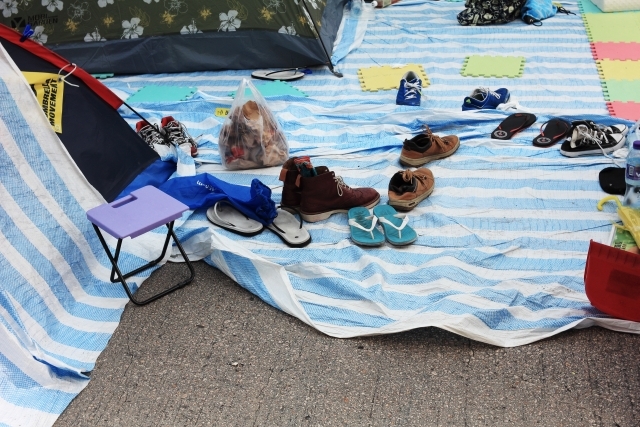 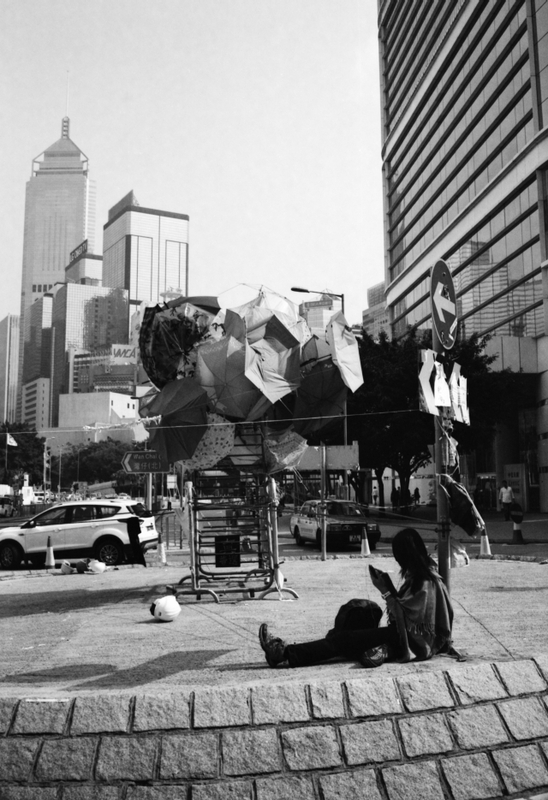 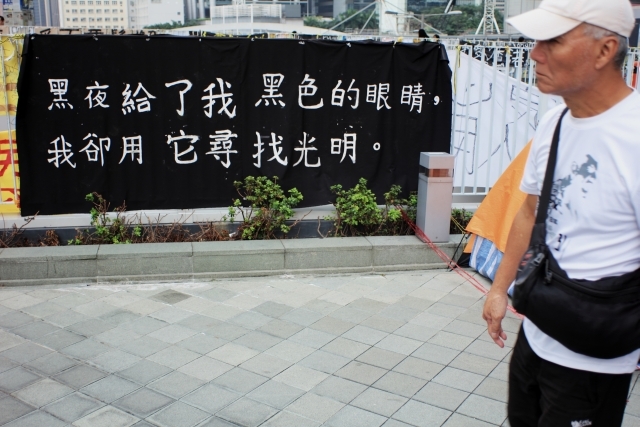 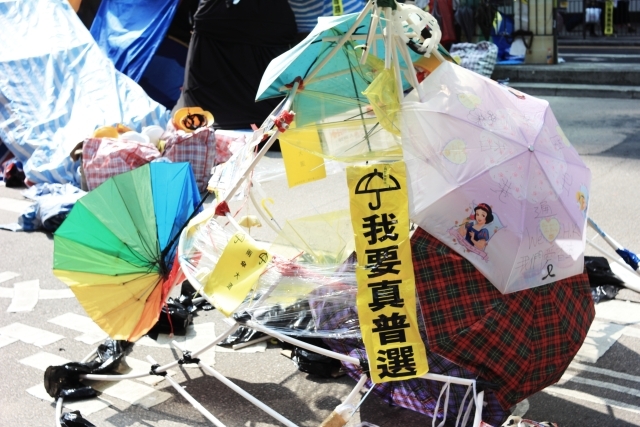 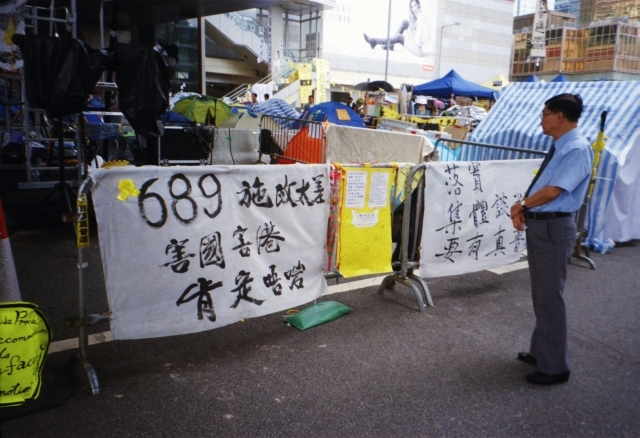 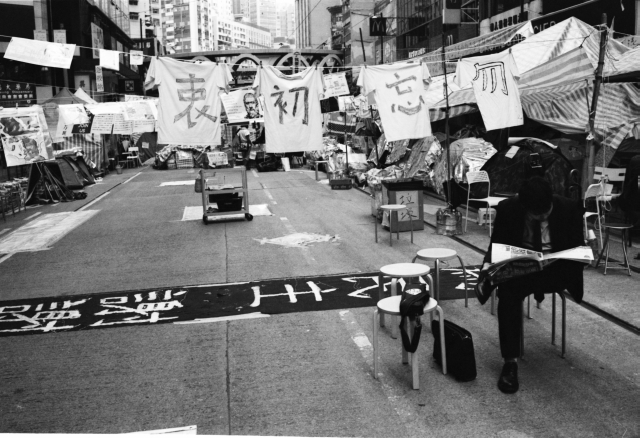 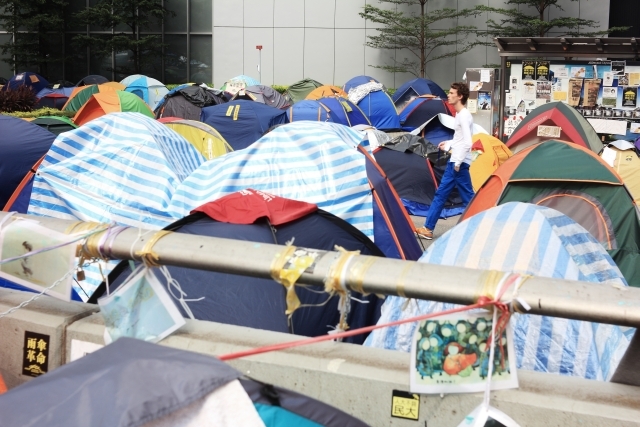 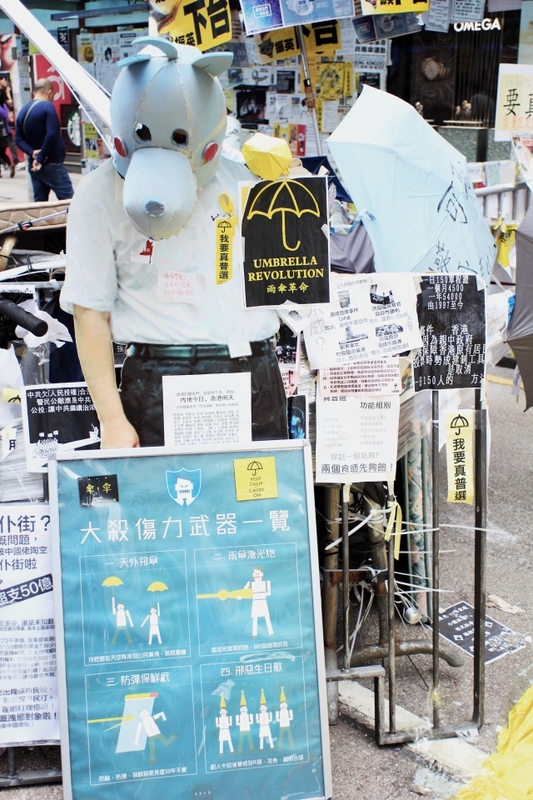 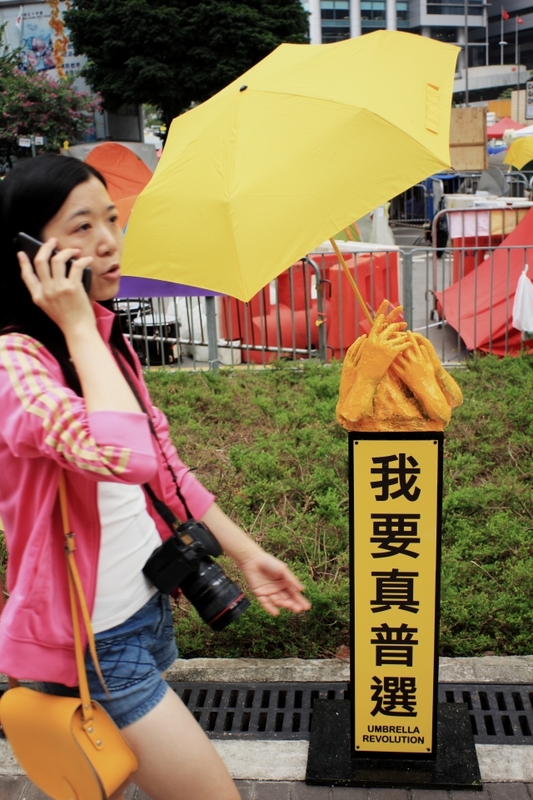 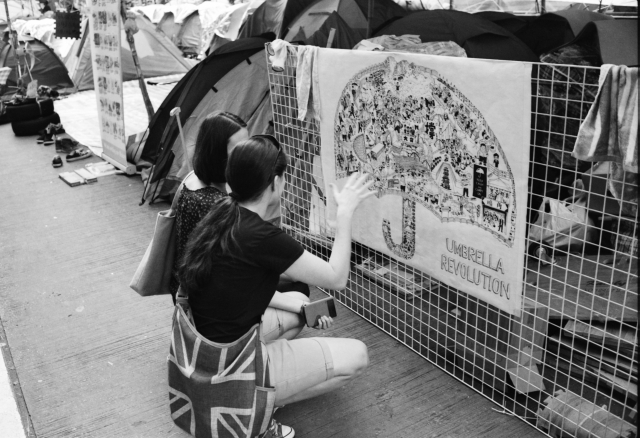 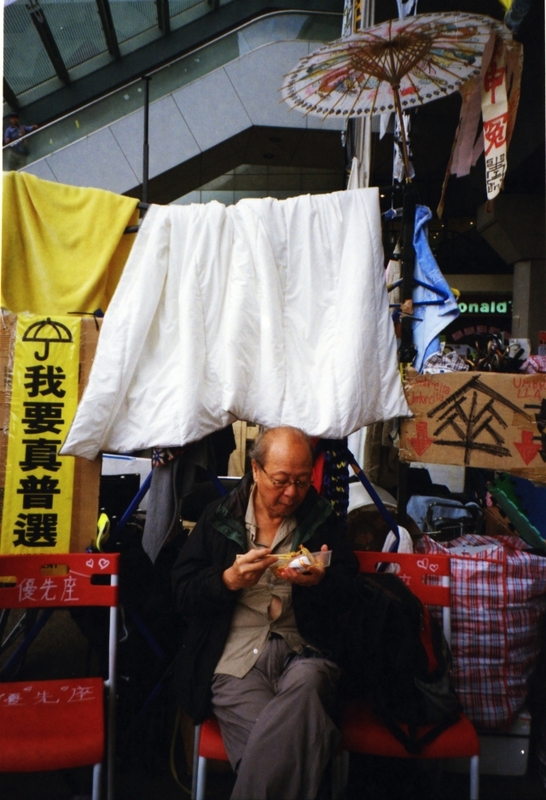 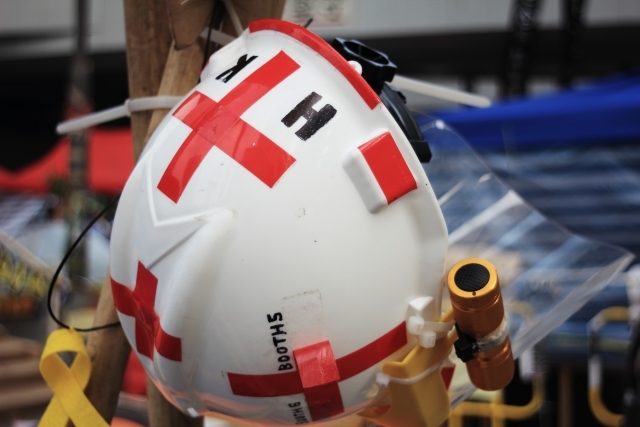 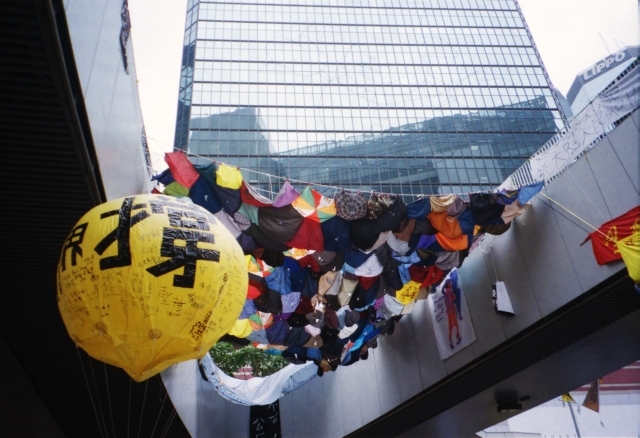 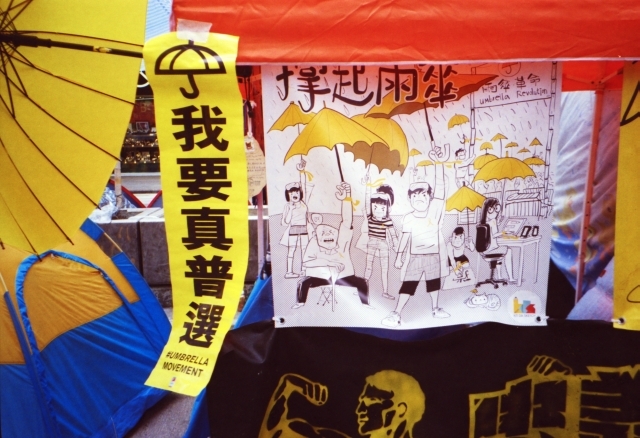 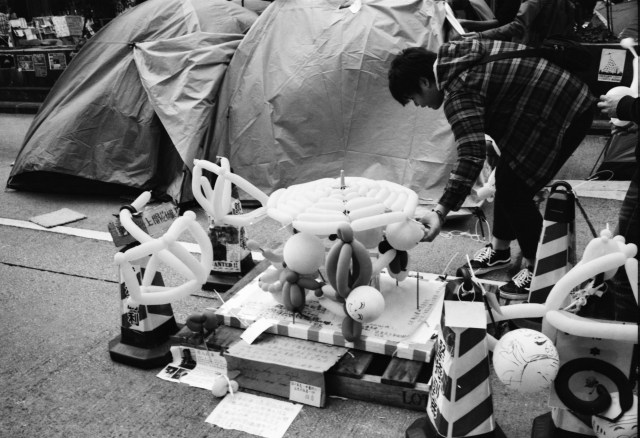 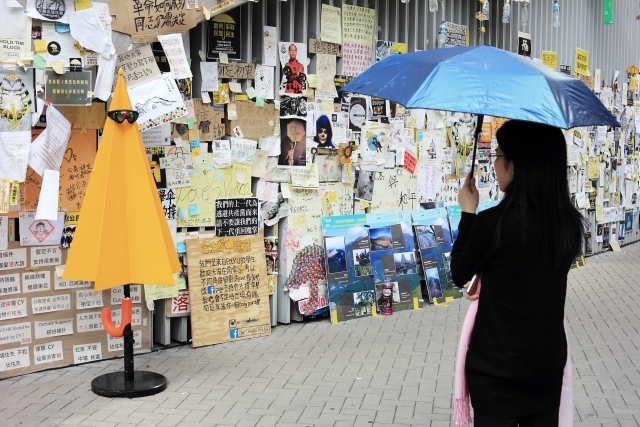 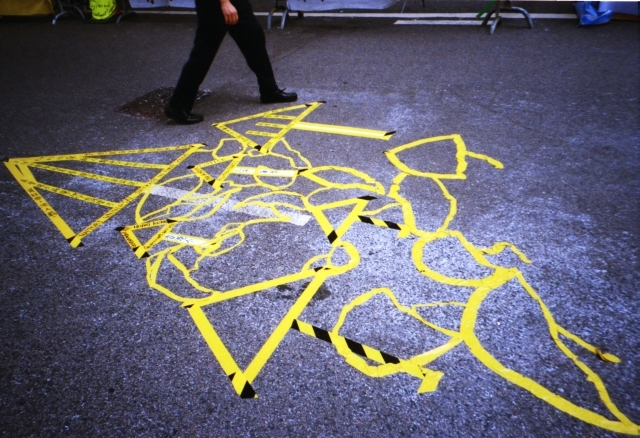 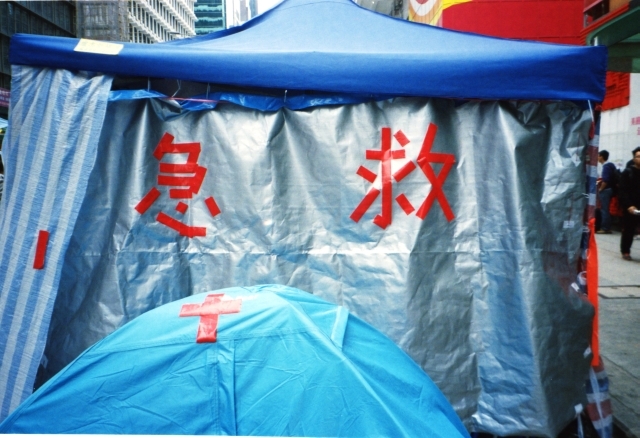 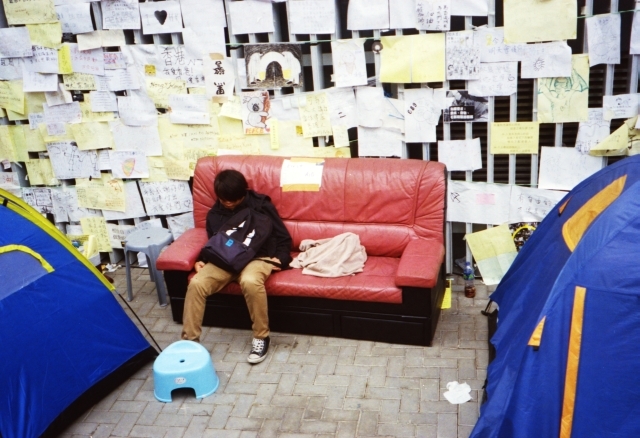 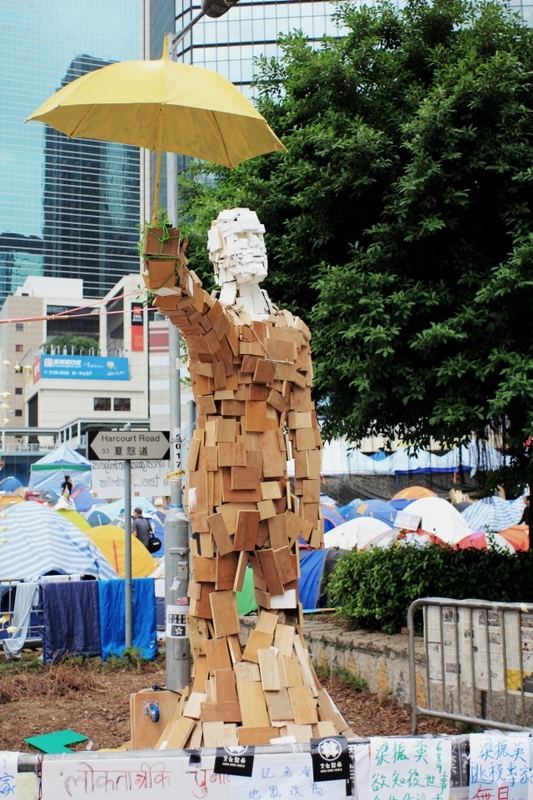 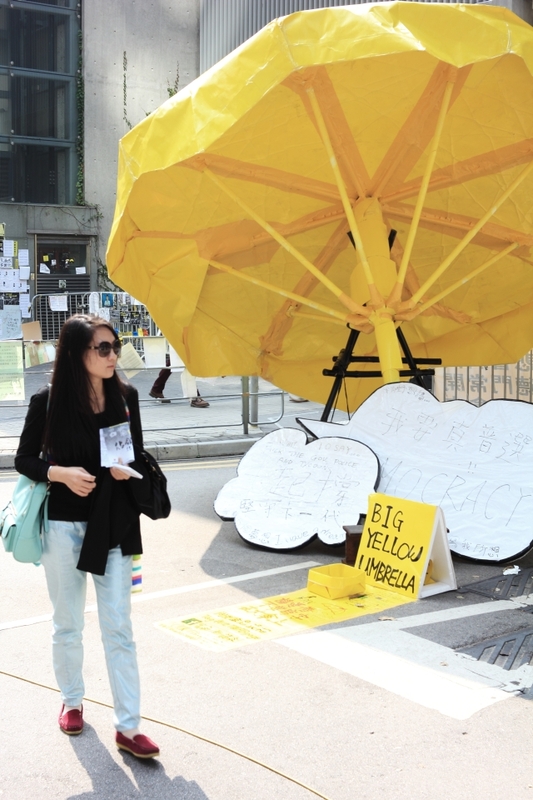 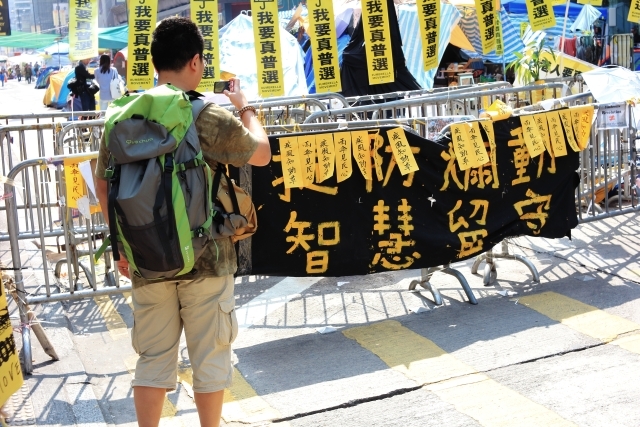 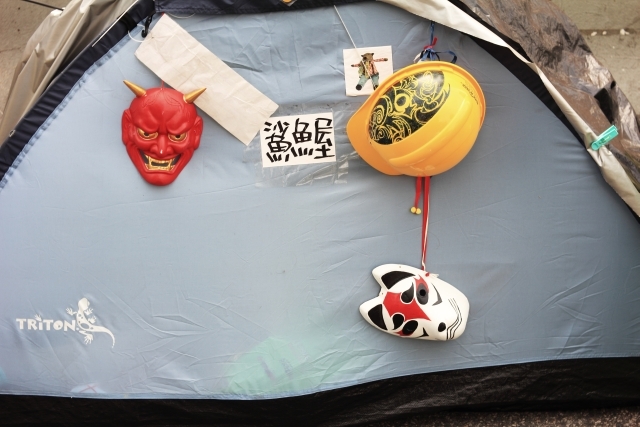 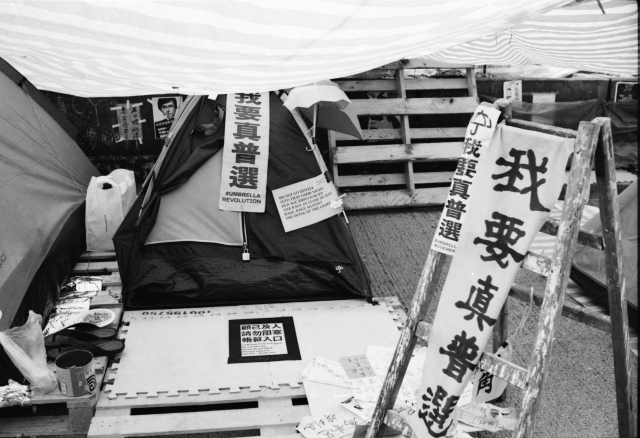 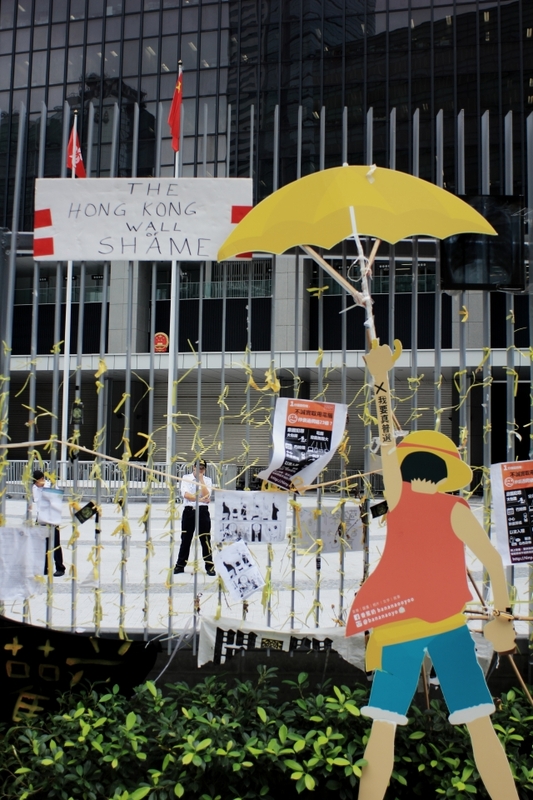 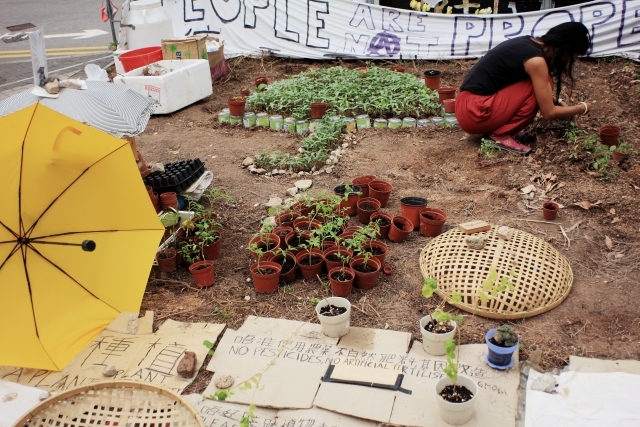 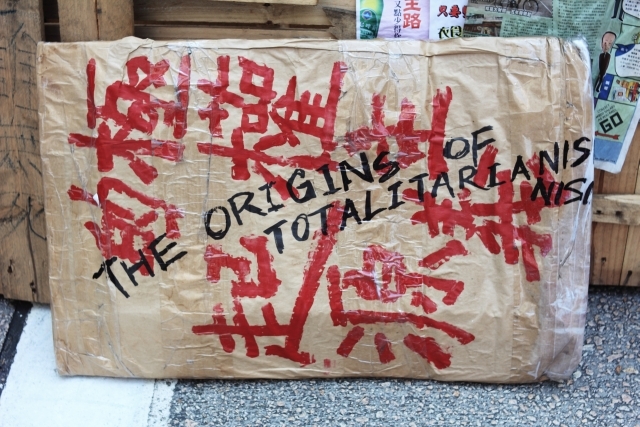 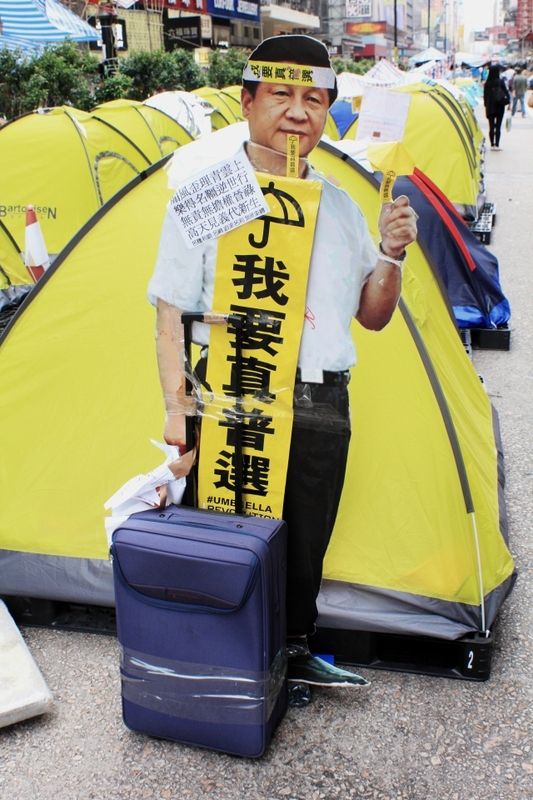 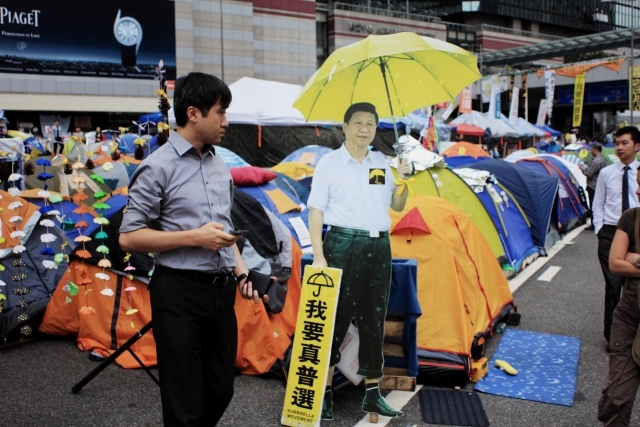 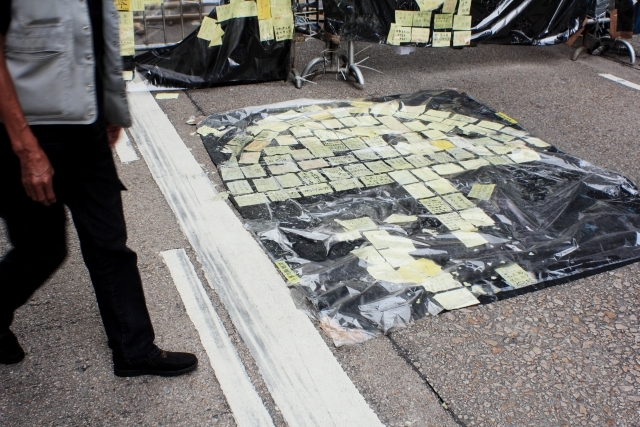 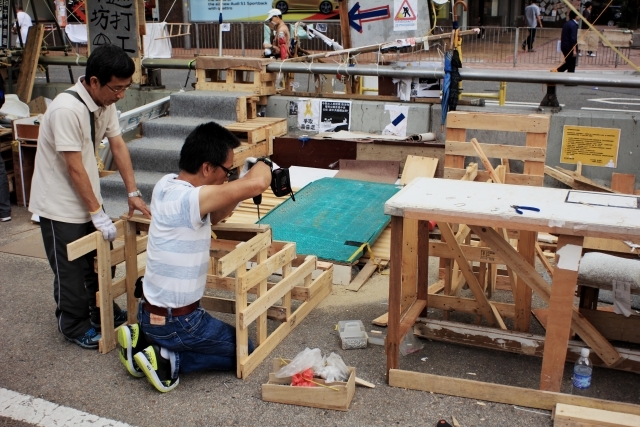 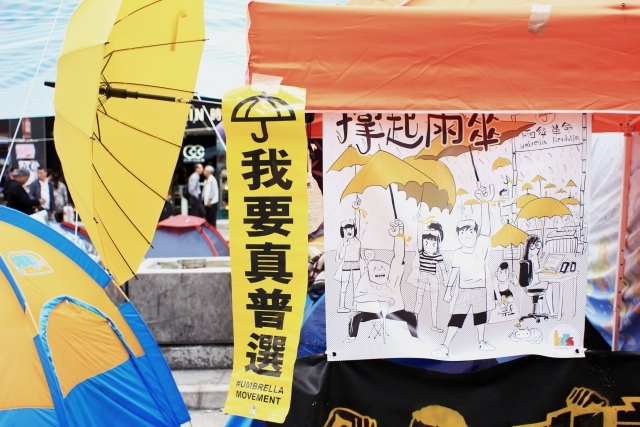 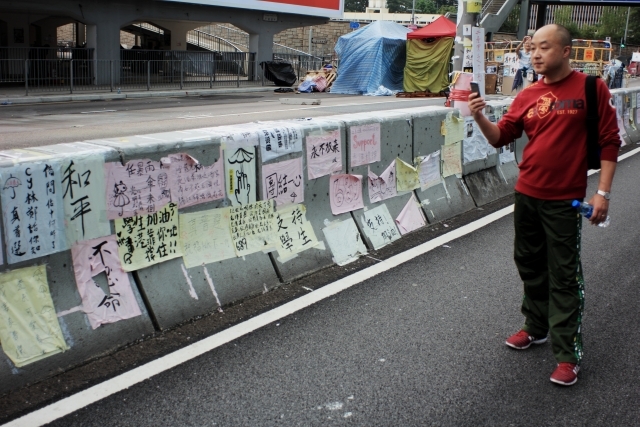 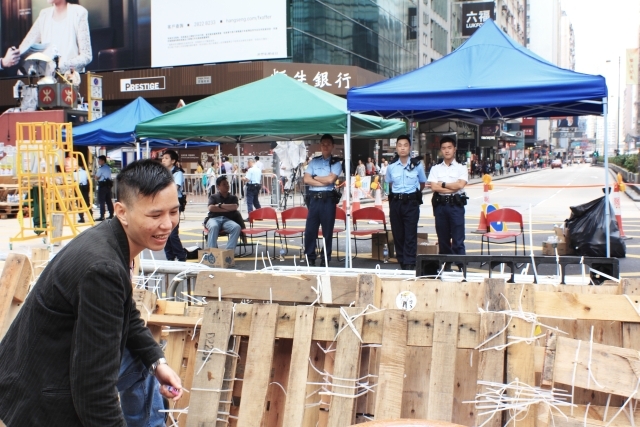 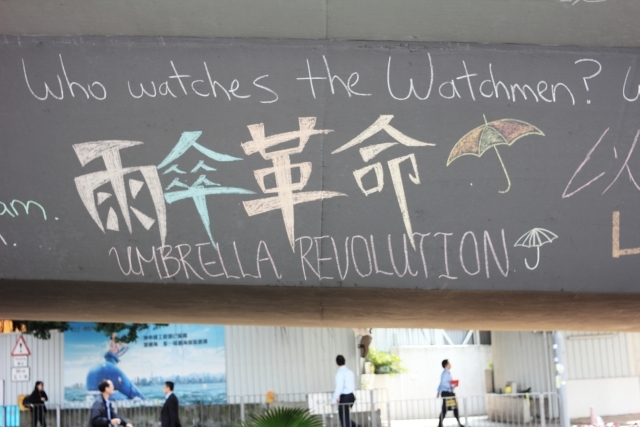 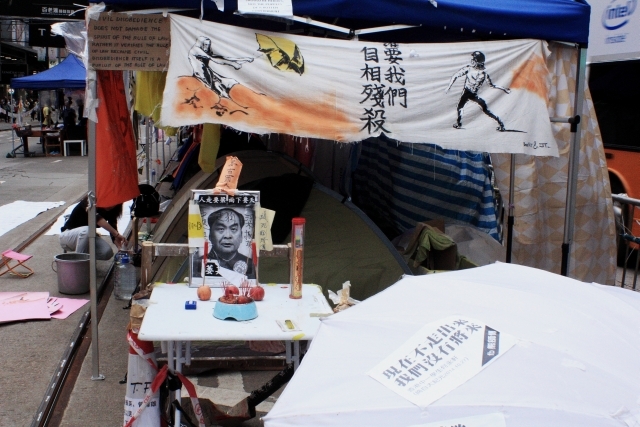 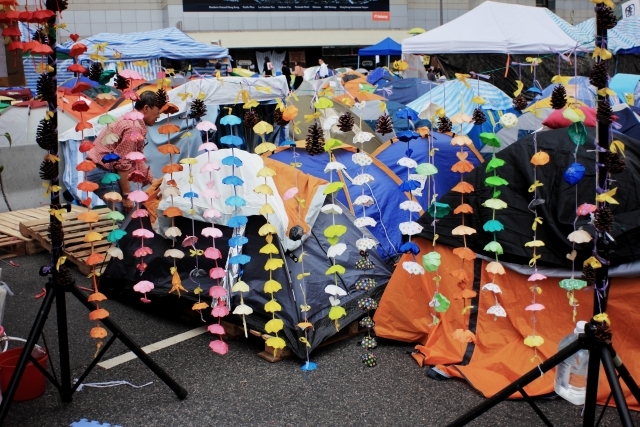 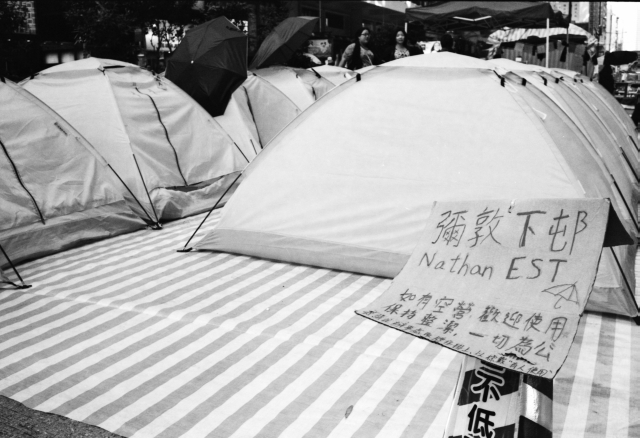 At Admiralty, the tents are still holding forth, and the art works are still looking robust. 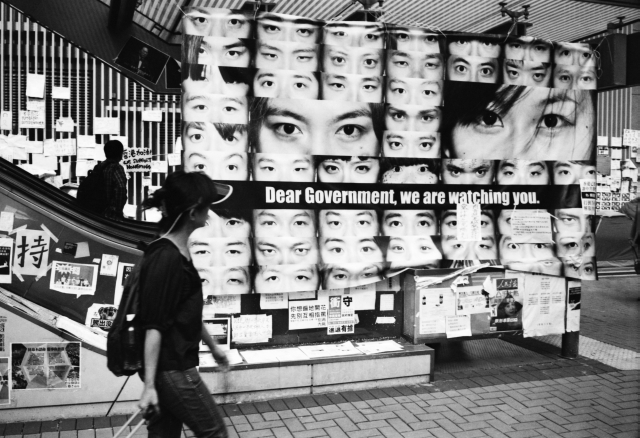 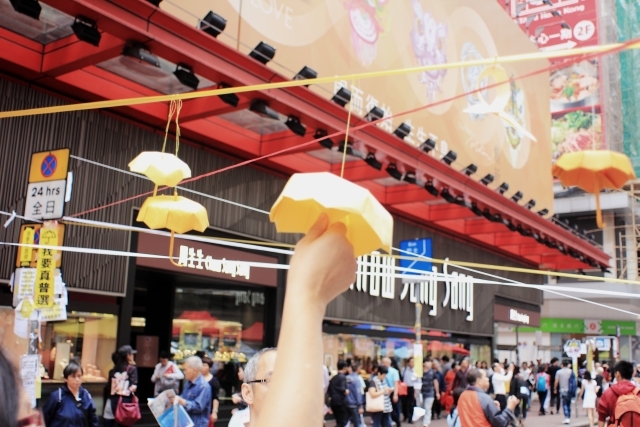 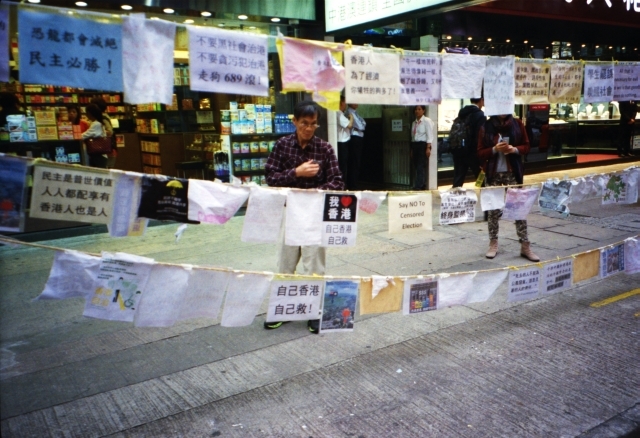 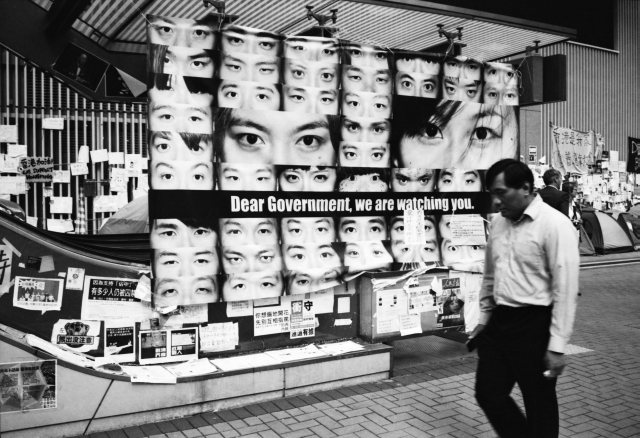 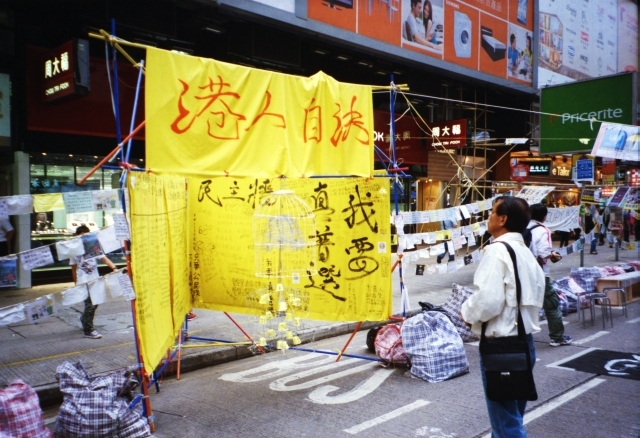 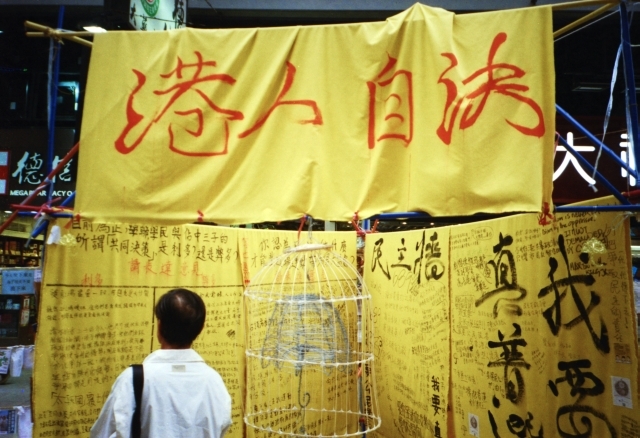 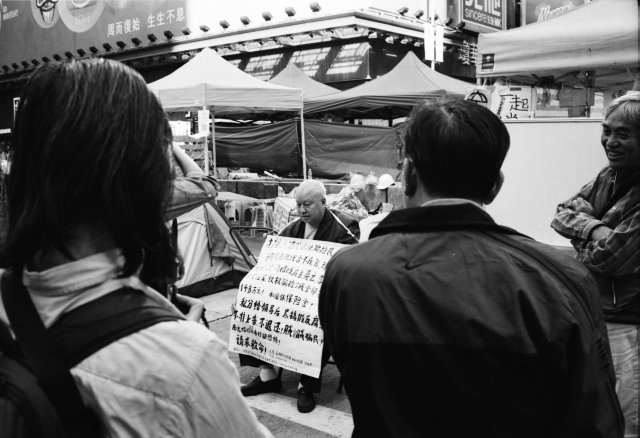 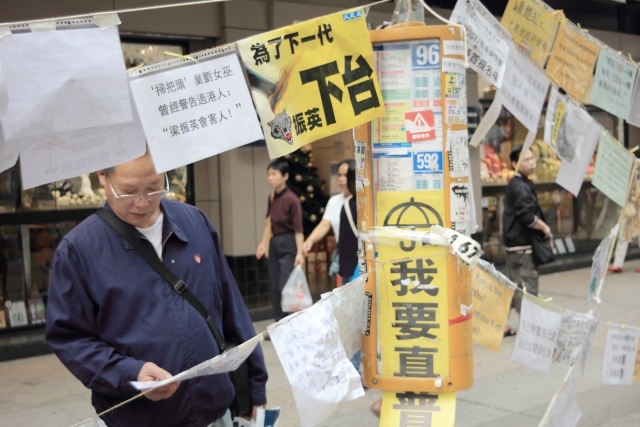 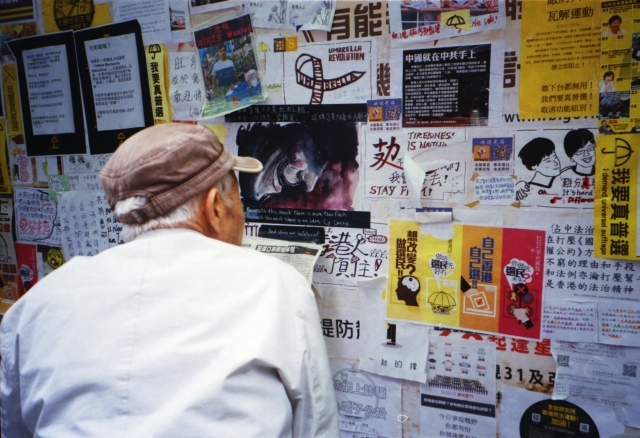 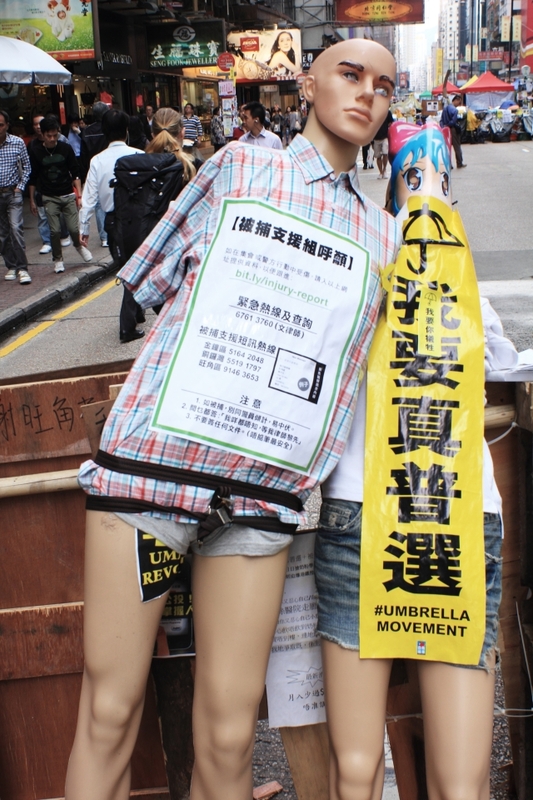 Causeway Bay is a bit quiet these days, though there’re still people who would pause to read the messages. 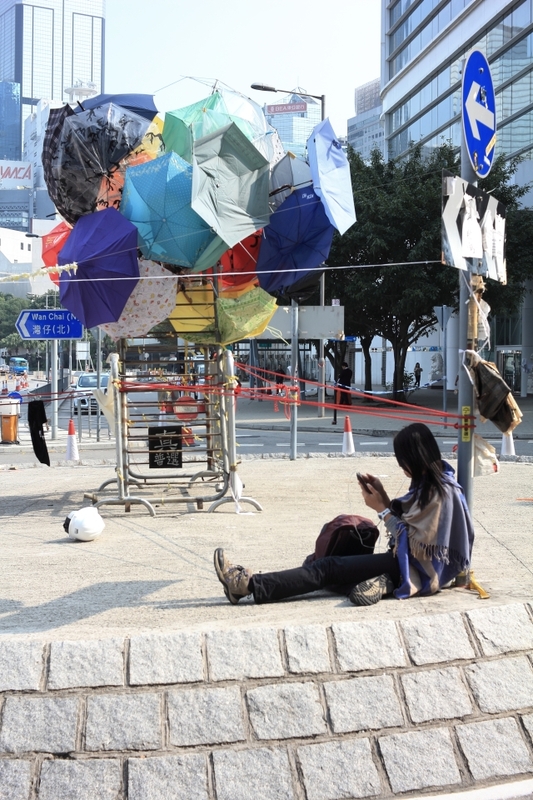 The sites are being cleared even as I’m typing this. 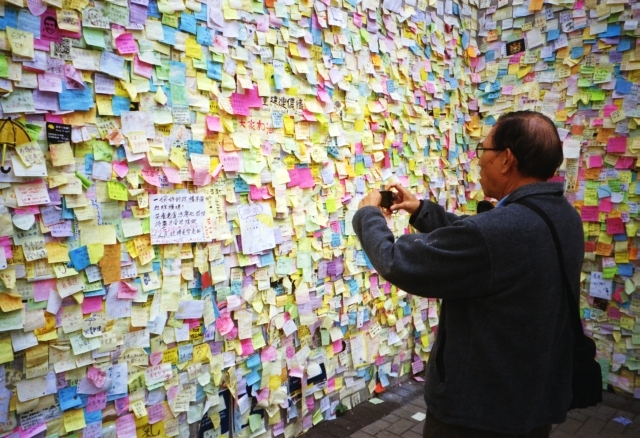 So, this is going to be memory soon. 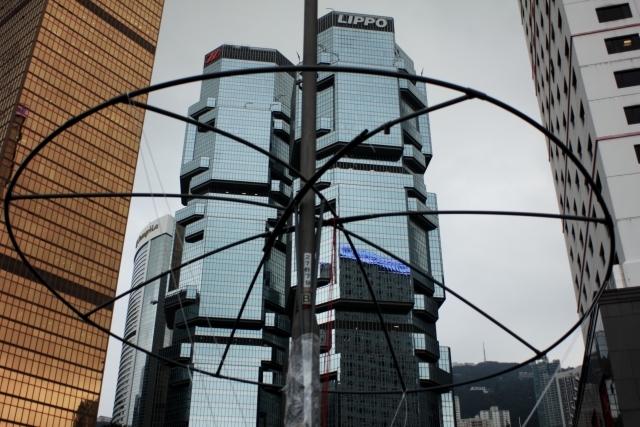 So – I managed to go to all three sites on the same afternoon. 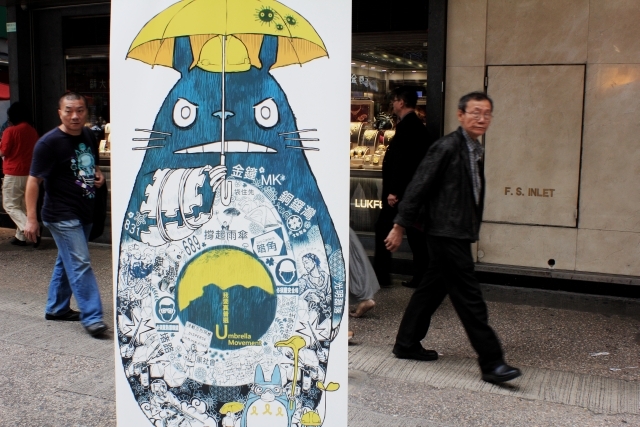 I’ll never look at umbrellas the same way again. 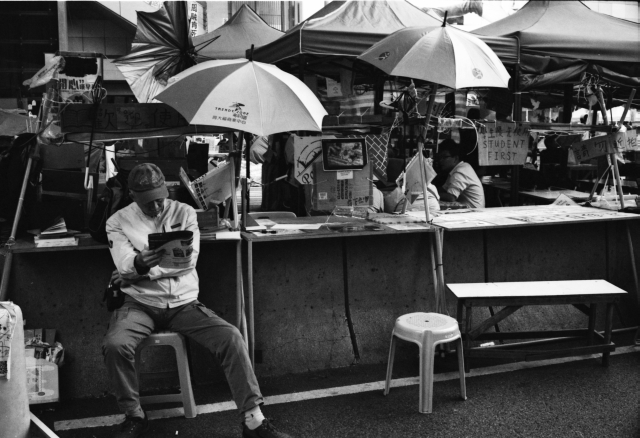 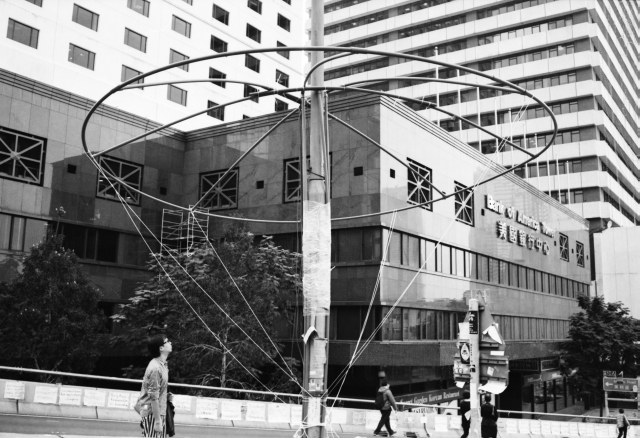 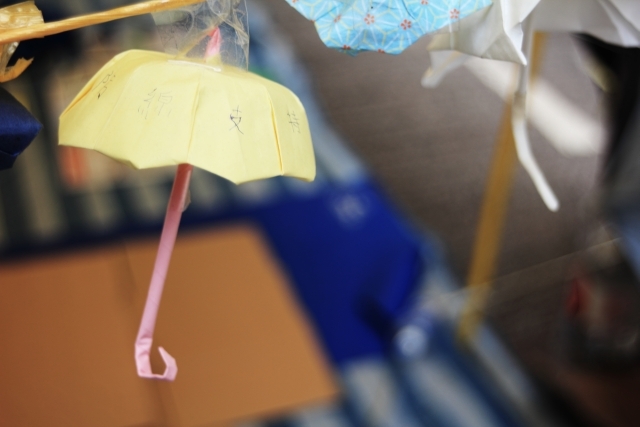 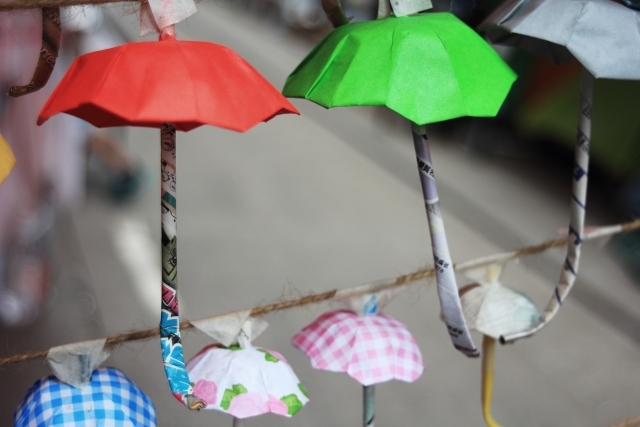 Umbrellas and street culture are now intertwined. 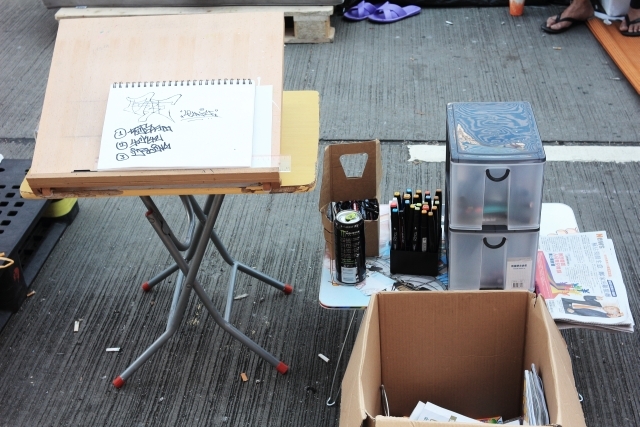 Lots of artists have emerged. 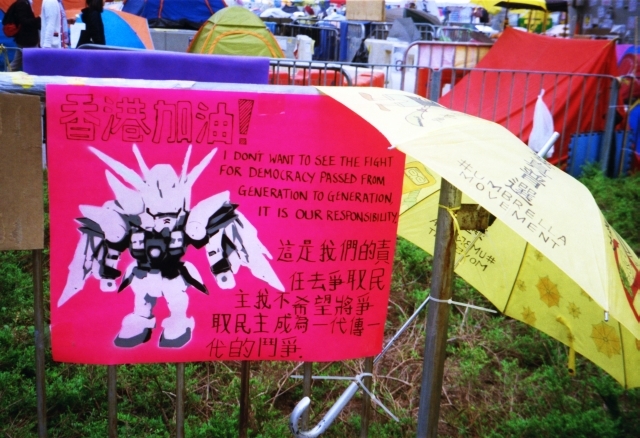 The hope of a generation is here. 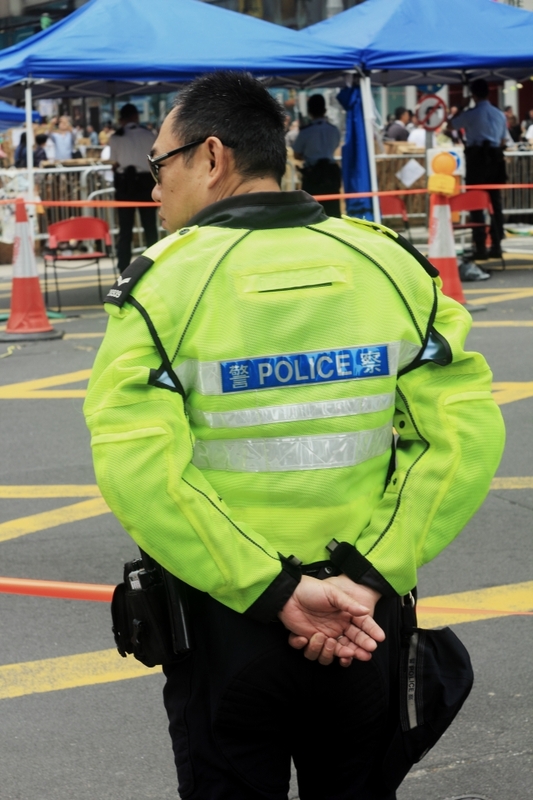 I’m ambivalent when it comes to the police. 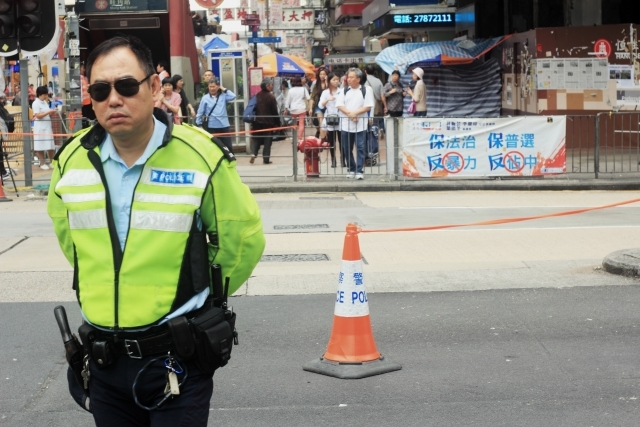 The police stands for law and order. 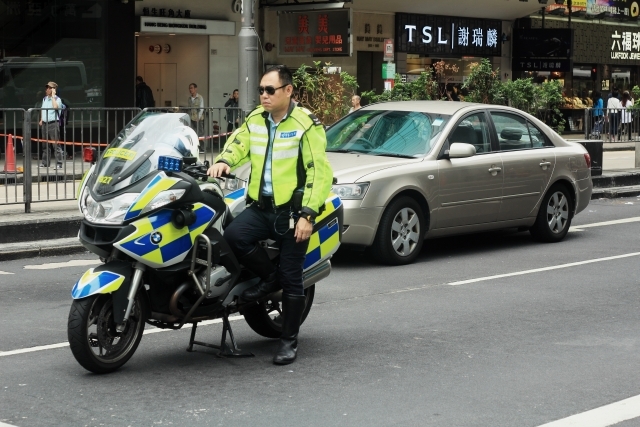 I respect the police, but what happens when the law privileges a particular social order that is in question? 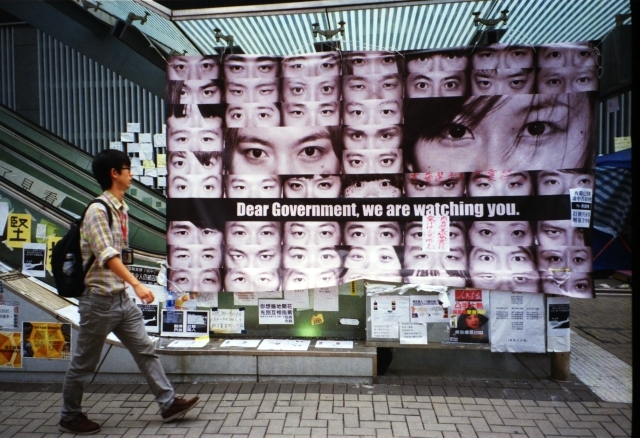 We’re all waiting and watching. 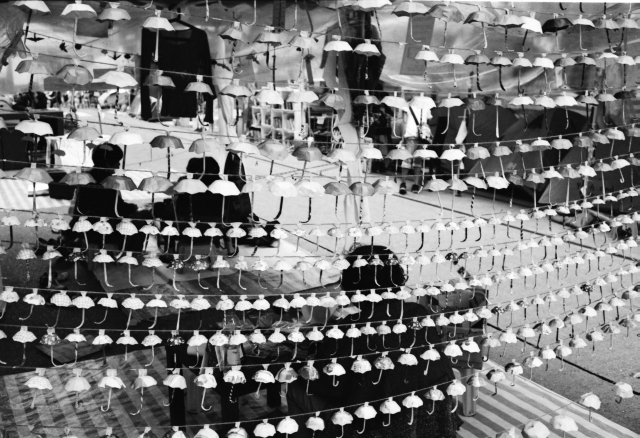 We see the organic growth of a community. 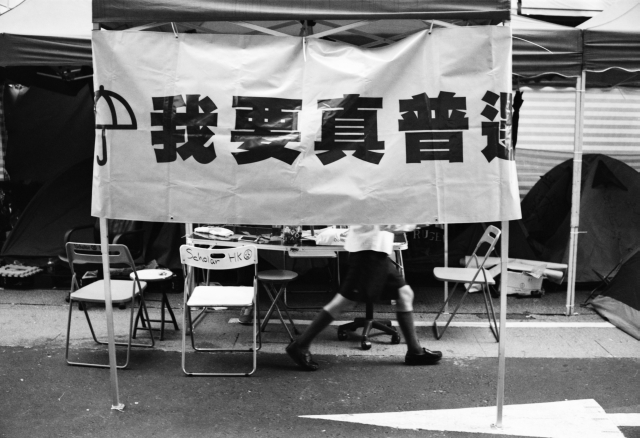 A community that stands for something. 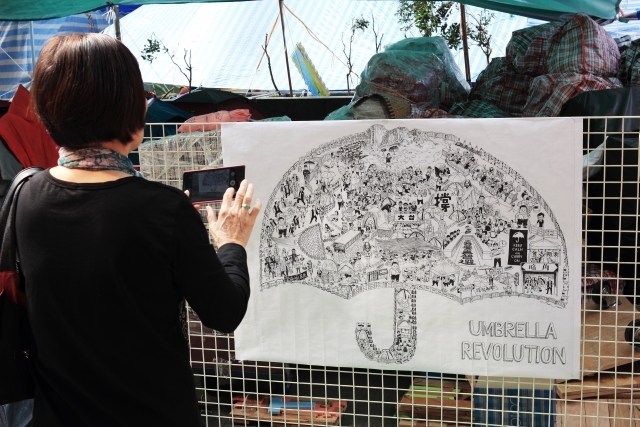 An artful and thoughtful community is emerging. 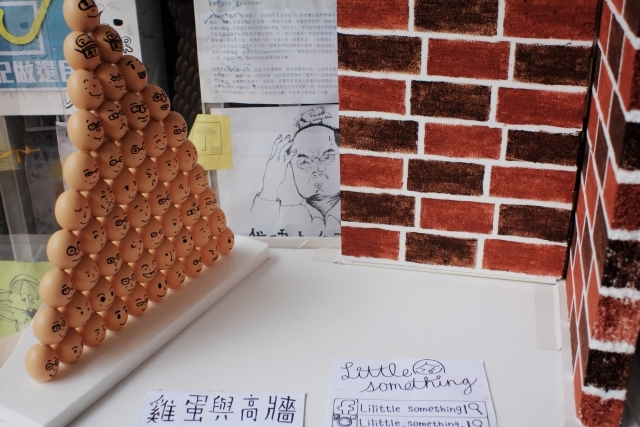 Though it’s all eggs against a brick wall. 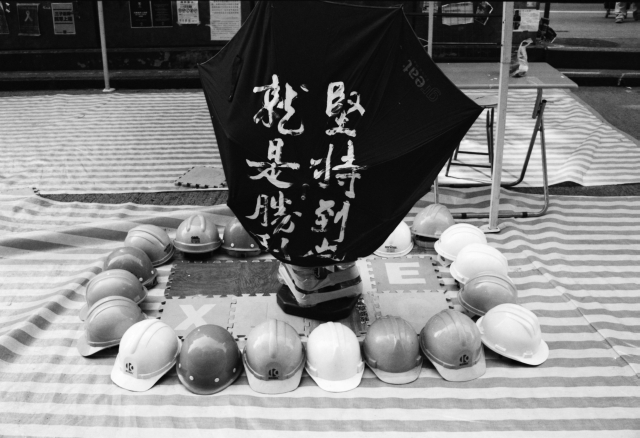 A poem by Gu Cheng entitled “A Generation”: Dark night has given me dark eyes, but I’m using them to look for brightness. 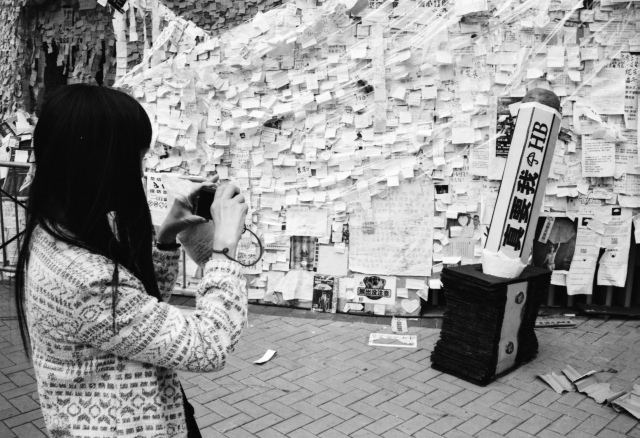 These are students of history and poetry. 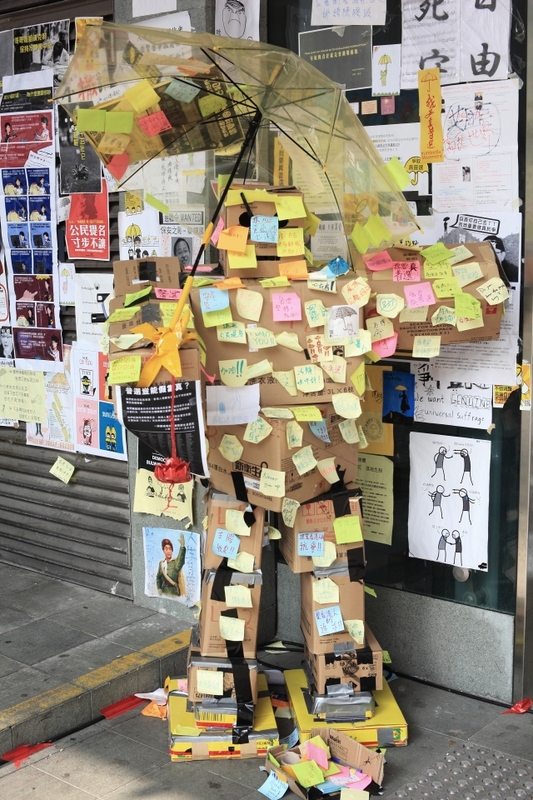 I see students like this on campus every day. 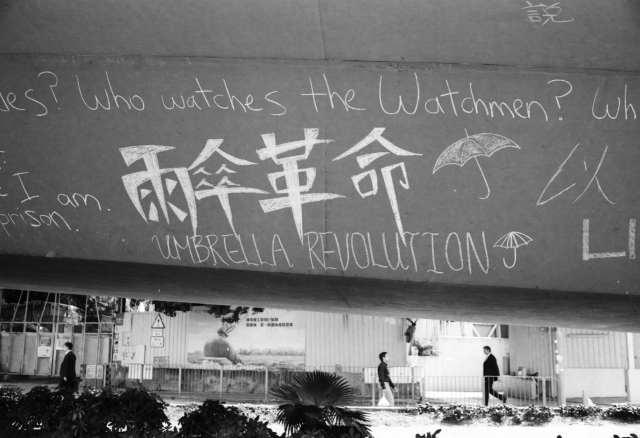 I teach them poetry and creative writing. 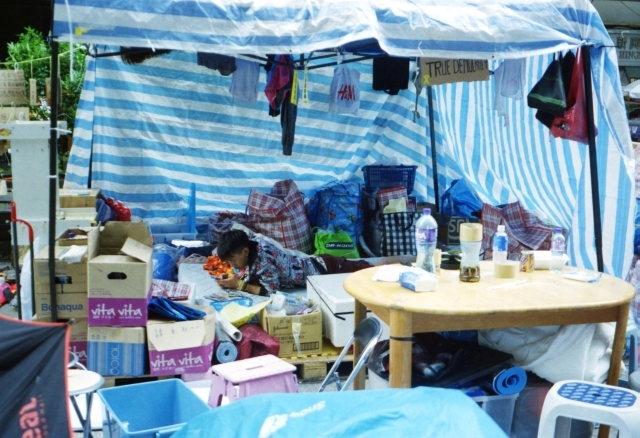 They’re somewhat goofy, always respectful, and many do have a strange fondness for Doraemon soft toys. 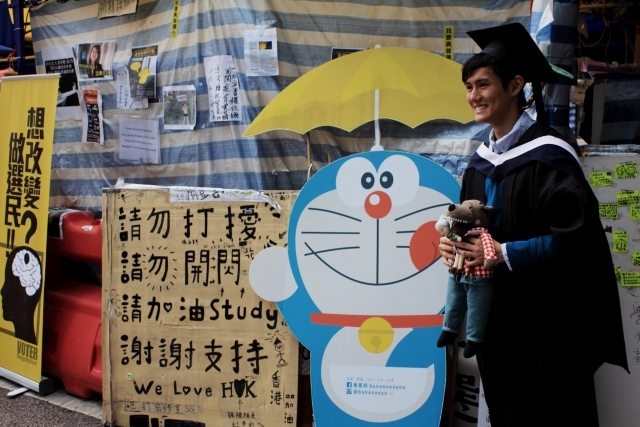 They bring these soft toys along with them for pictures on graduation day. 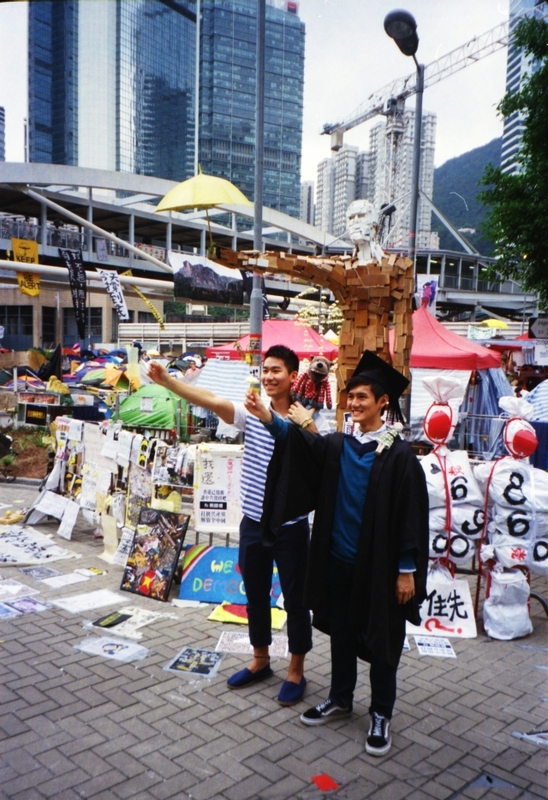 Now they’re a force of social change, graduating with honours. 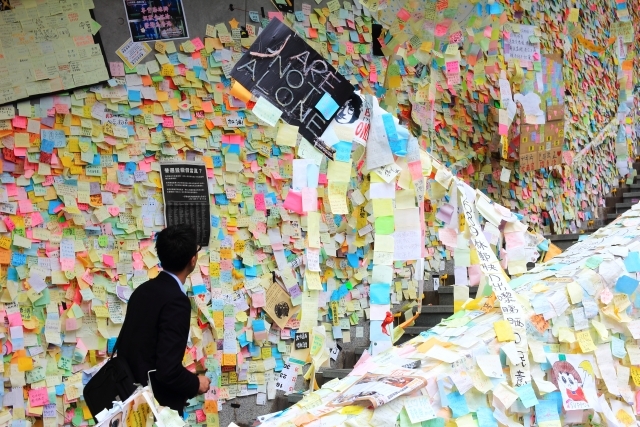 It’s not just the students, of course. 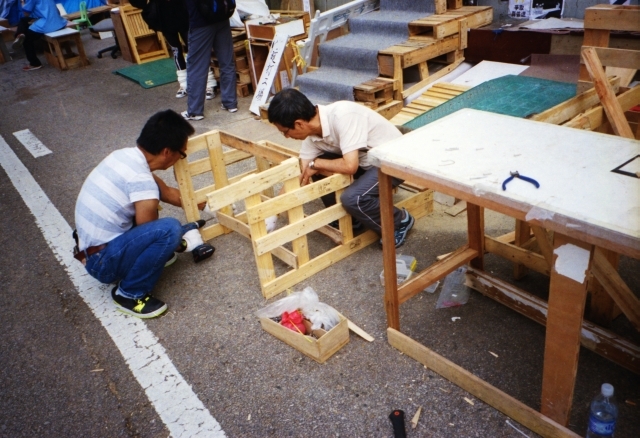 The carpenters show up to be carpenters. 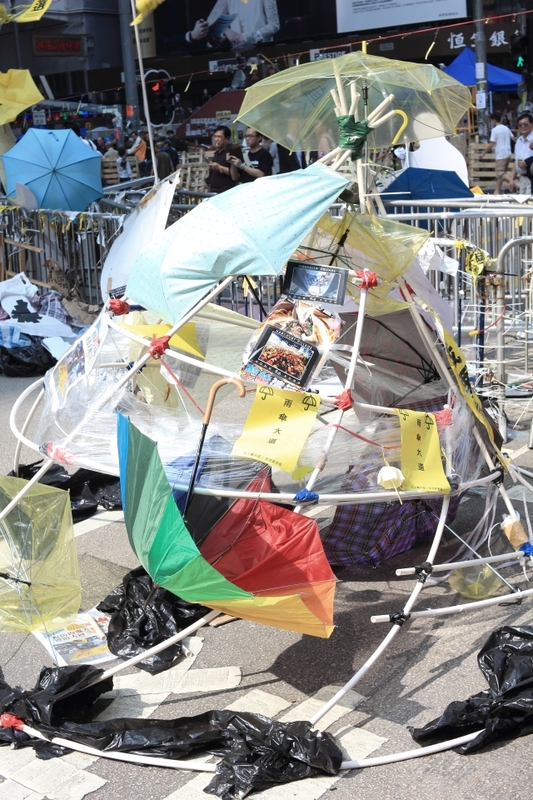 Even if the barricades are cleared and all have gone home, Occupy Central would be that powerful idea that will be always ever present. 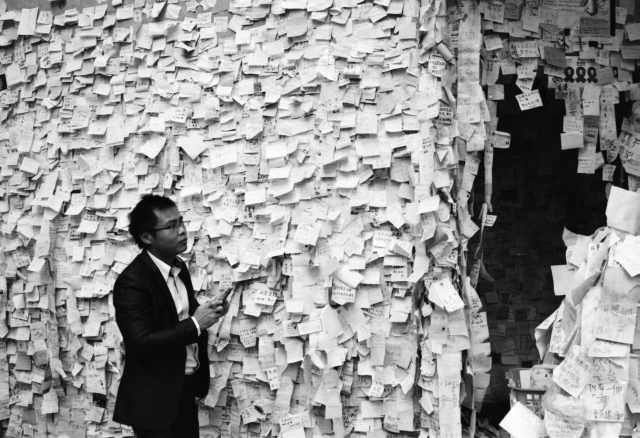 The rest is just documentation. 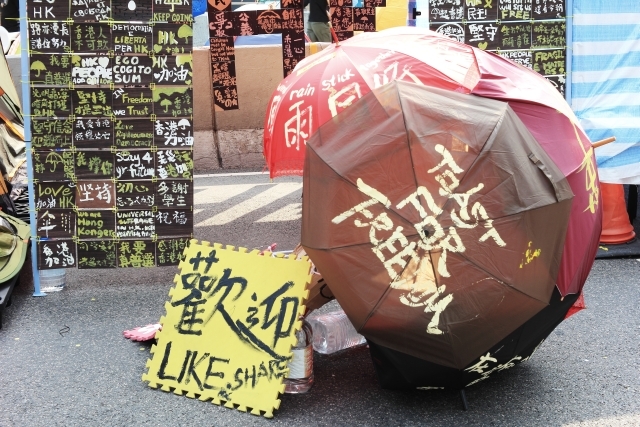 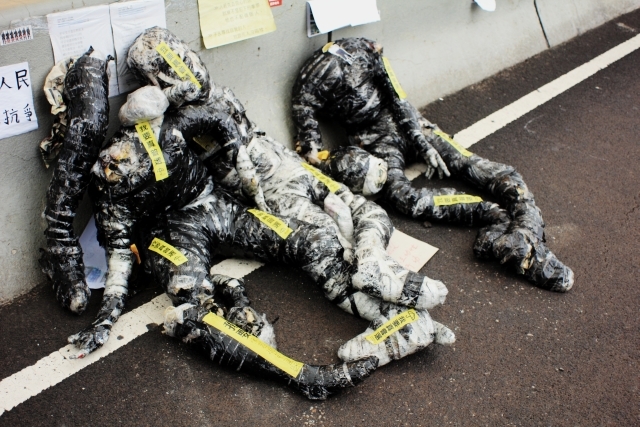 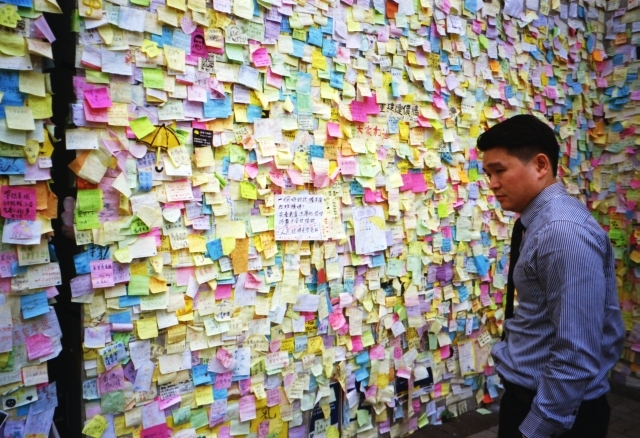 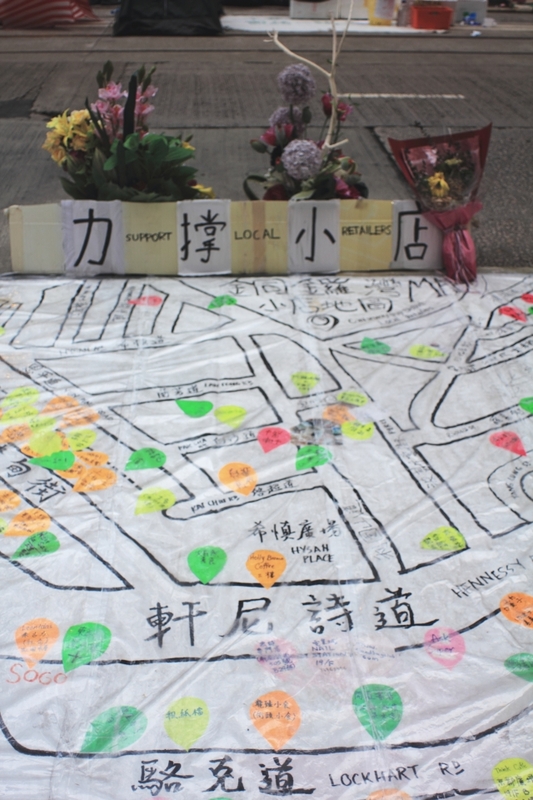 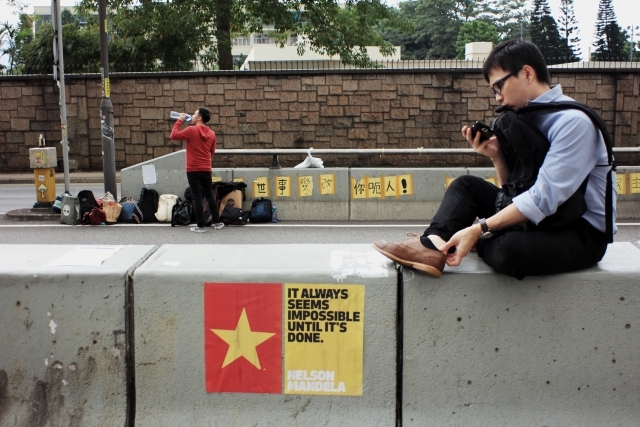 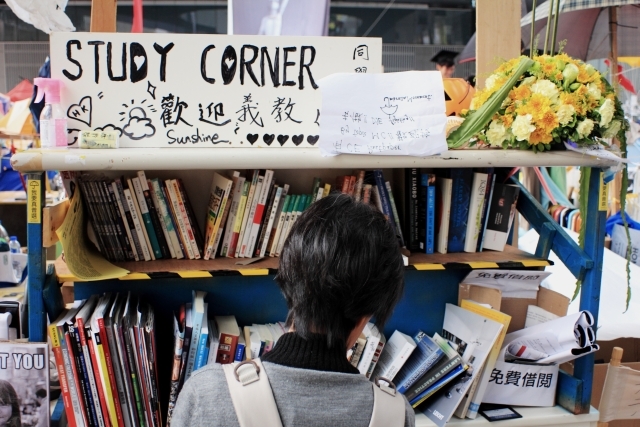 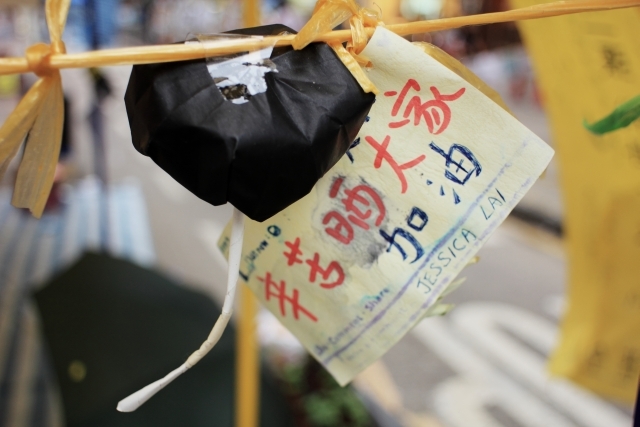 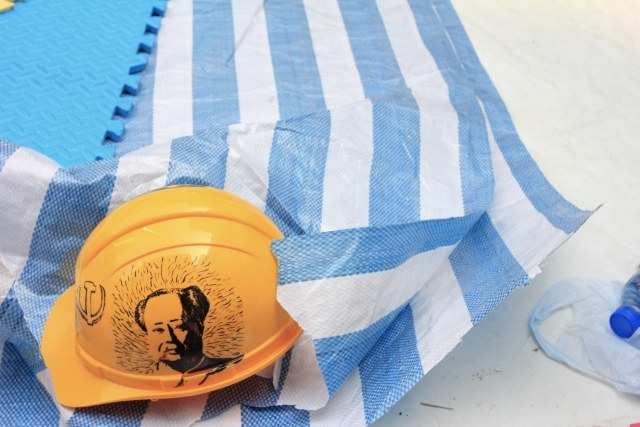 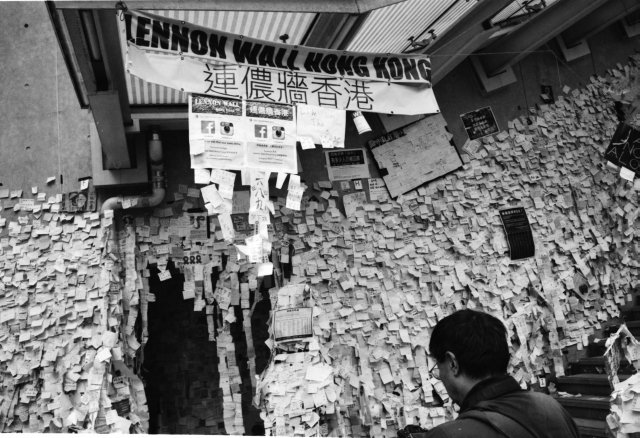 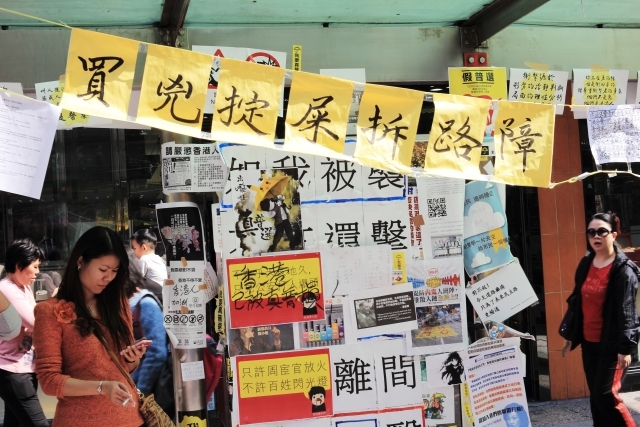 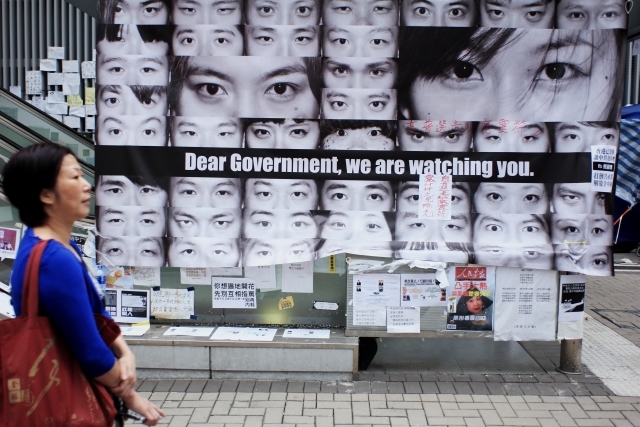 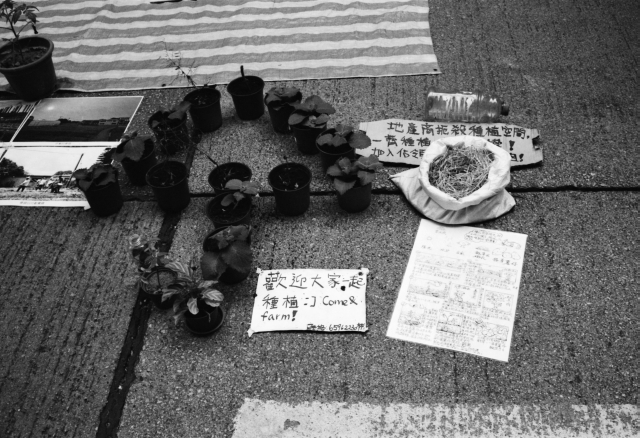 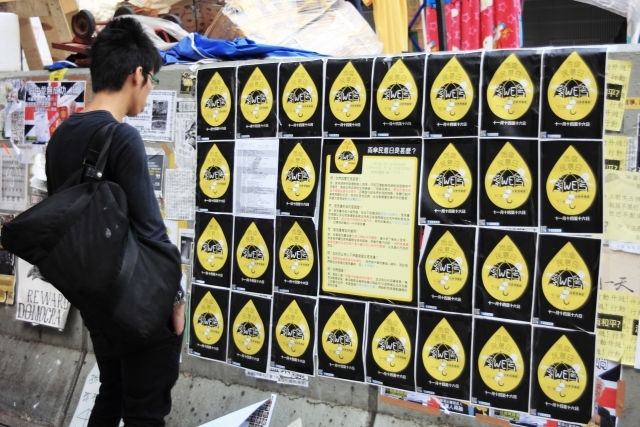 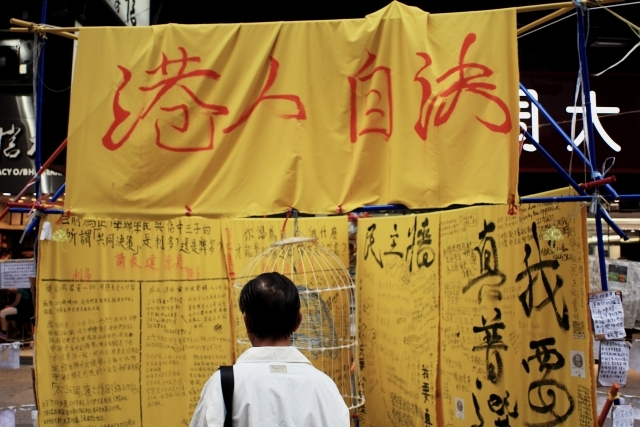 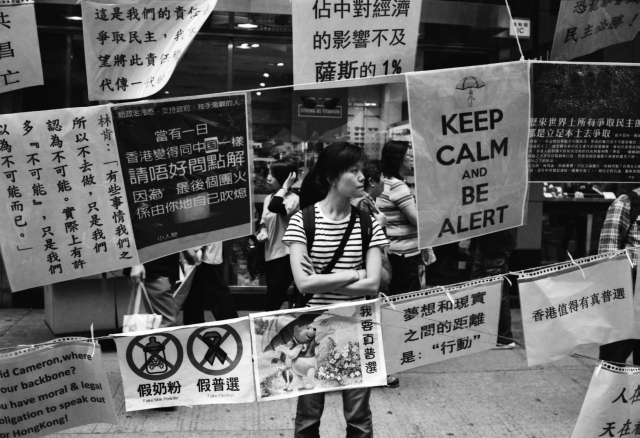 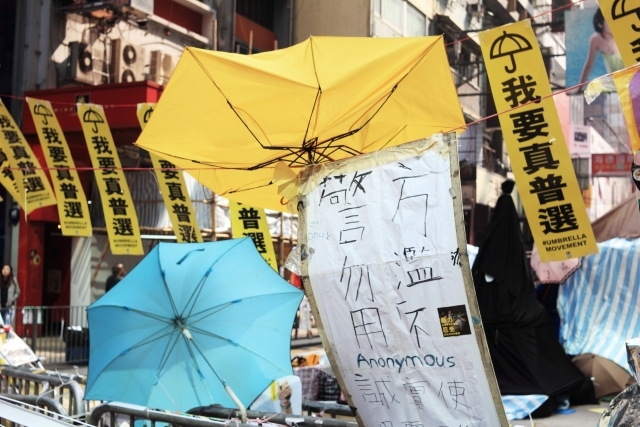 Occupy Central is already set in memory, in photographs, social media, in newspaper and government reports. 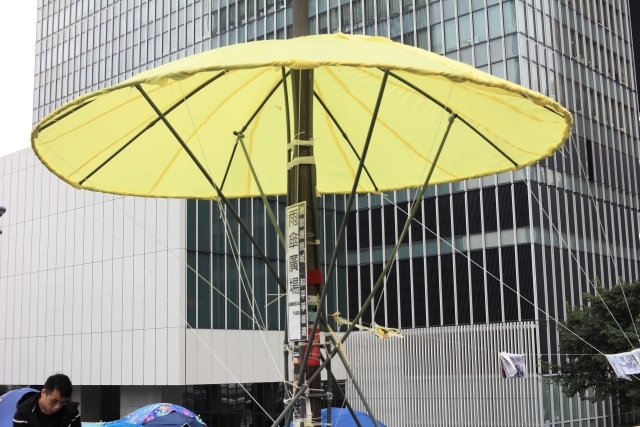 The skeleton of the umbrella is strong. 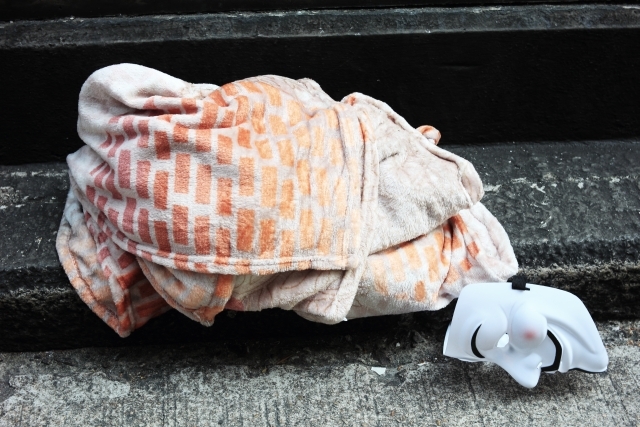 There are no wasted bodies on the streets. 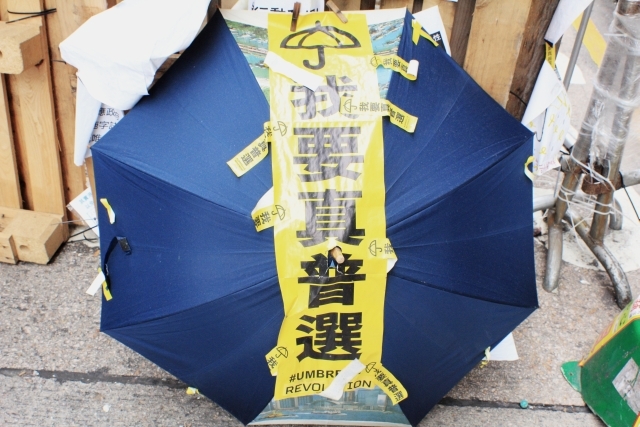 The umbrella is looking somewhat tattered but the sentiment is strong. 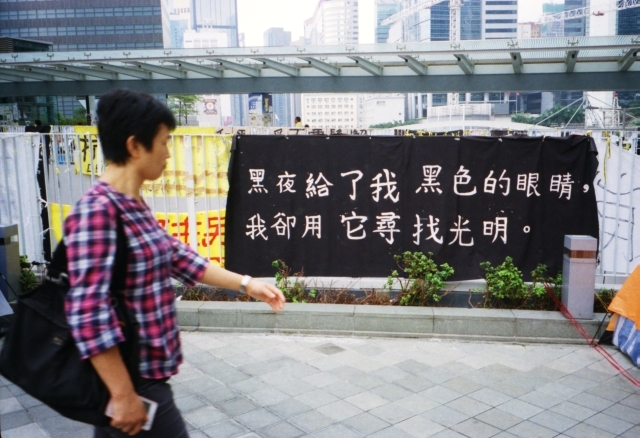 Rough translation: the work is hard but keep going. 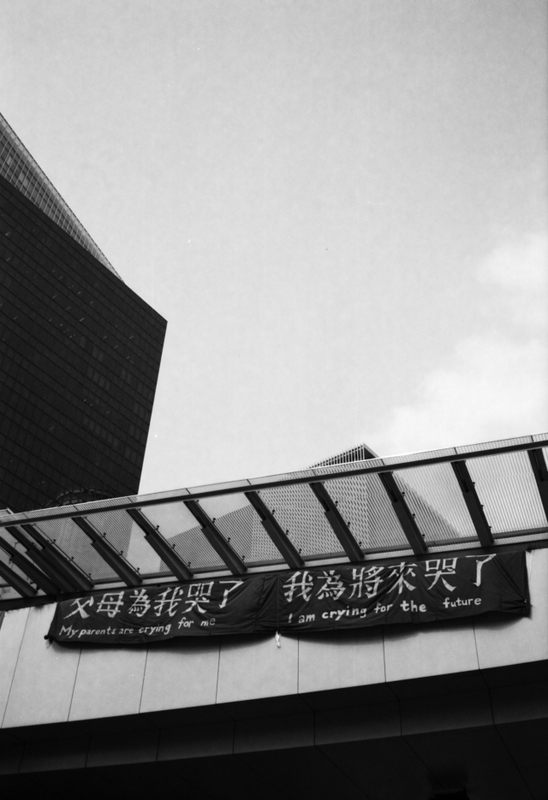 In the end, history will decide.